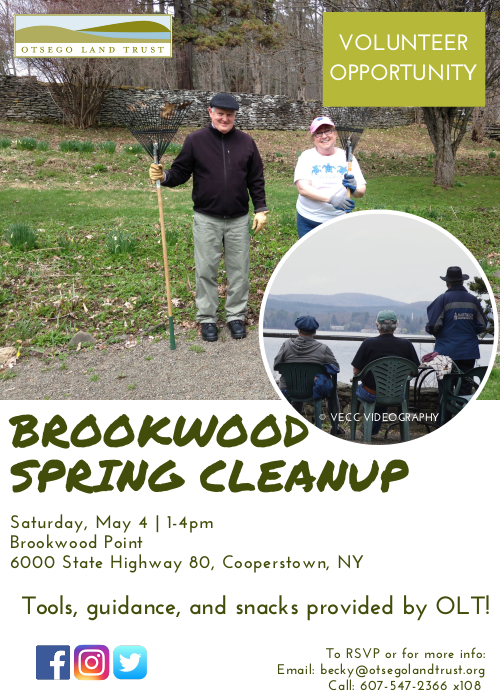 Otsego Land Trust is having their annual Brookwood Point spring cleanup on Saturday May 4th, 1-4pm, Brookwood Point, 6000 State Highway 80, Cooperstown, NY. They are searching for volunteers to help them prepare for the upcoming season. Please consider helping them out this spring. For more information and to RSVP contact Becky Talbot becky@otsegolandtrust.org. 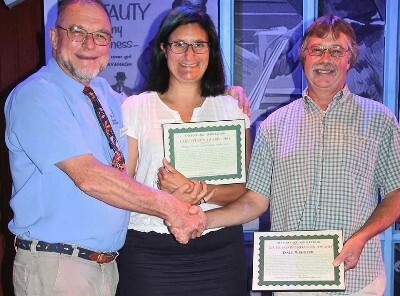 The Fly Creek Philharmonic's March 2019 performance "Water, Water Everywhere" about water garnered a unanimous decision among the troupe to honor the Otsego Lake Association. 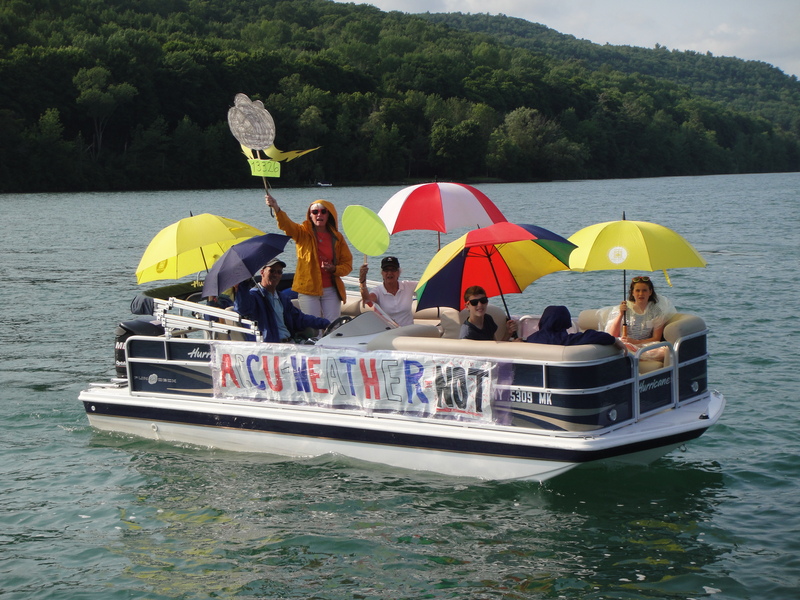 OLA is awarded a portion of the profits from the show to help continue the good work of educating, advocating and participating in the health and well being of Otsego Lake. Tickets on sale now at the Fly Creek General Store and at Riverwood in Cooperstown! 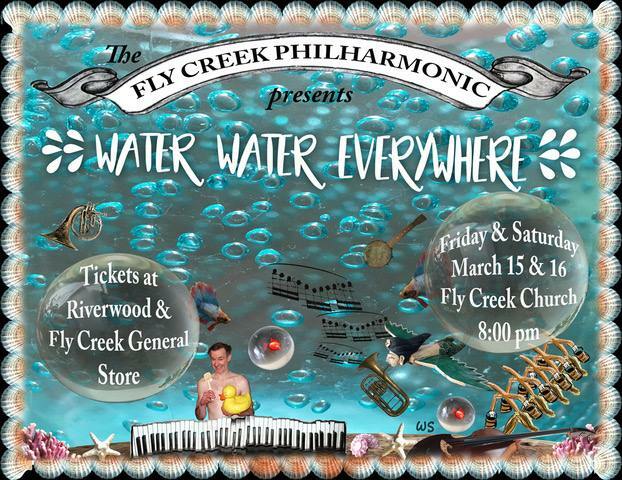 Don't miss your chance to see the celebrated Fly Creek Philharmonic live March 15 and 16. Glimmerglass Film Days, a showcase for powerful films reflecting humanity’s complex relationships with the natural world, will take place November 8-12, 2018 in Cooperstown, New York. The festival features screenings of several award-winning films, as well as encounters and collaborations with internationally known artists, activists and aficionados in a 5-day series enlivened by local food tastings, and optional trail hikes and bike tours, all designed to celebrate the natural and historic resources of the Cooperstown region. OLA is proud to sponsor "Leaning into the Wind" this year. For more information visit Glimmerglass Film Days. This storm drain is located in front of Stagecoach Coffee on Pioneer Street. 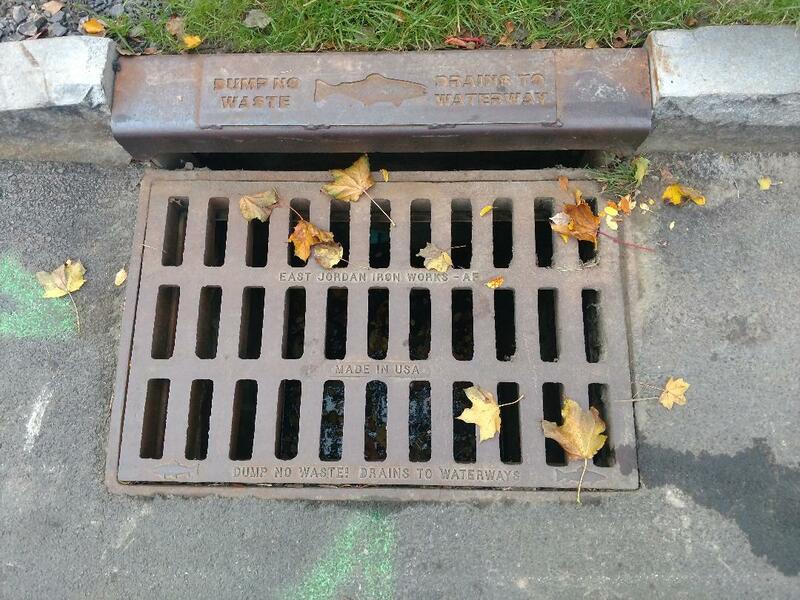 It's a nice reminder that our storm drains in Cooperstown flow into the local waterways. This is the time of year to search for the most invasive aquatic plant found in NY waters. Would you do one last favor for your lake this summer and take some time to search the shoreline, boat launch areas, swimming areas. and any other places you can look for this plant? Recruit as much help as you need. Use the DEC/NYSFOLA AIS Shoreline Protocol to guide your hunt: http://nysfola.mylaketown.com/uploads/tinymce/nysfola/AIS%20protocol%202016.pdf, but just get out there and look! Here's here's how to ID the plant. https://www.dec.ny.gov/docs/lands_forests_pdf/aishydrillaidsheet.pdf Note the serrated leaf, turion on the stem, and tuber in the sediment are key to the ID of this plant. If you think you've found hydrilla, please send digital photos (close up of leaves, tuber, and other identifiable parts on a white background please) with the location found to nysfolanancy@verizon.net. Please include follow-up contact information. Save a sample just in case. We can't stress enough how important it is to catch this invasive plant early. Known locations are in the NYS Canal System near Tonawanda, the Croton River, Central NY (including a large population in Cayuga Lake). So, it could be anywhere. Also, please let us know if you looked and how much of your lake you surveyed even if you didn't find the plant. Keeping track of where this plant "isn't" is just as important as knowing where it is. If you have any questions, please don't hesitate to contact us. We will also communicate the results to the regional PRISMs (Partnerships for Regional Invasive Species Management). A note from Yu Chen at NYSDEC. A note from Chip Northrup. 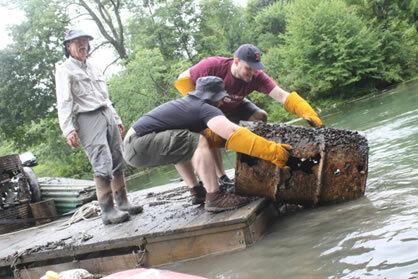 The Lions Club (John Rowley), Otsego Sailing Club, Biological Field Station Divers (Paul Lord) and several newly filthy volunteers cleaned debris out of the Susquehanna River Saturday from the lake to the Mill Street weir for the first time in recorded history, meaning probably ever. Among the archival flotsam and jetsam were approximately 30 tires, a half dozen paint buckets, pipes, traffic cones, an oil drum, a rather nice fishing rod and reel, dozens of apothecary bottles, cinder blocks, a WayFair carpet, baby carriage, Price Chopper shopping cart, what appears to either be Jimmy Hoffa's left femur or that of a deer, a whaling ship anchor, and a Pete Rose Hall of Fame T shirt. Many thanks to the Lions, Sailors, Biologicals and all the soon-to-be-clean-again volunteers! Butch Weir, Cooperstown, left, looks on as Matt Chisdock and Doug Perry haul an old 50 gallon drums aboard the Otsego Sailing Club work Barge this morning during a river clean-up behind Bassett Hospital. 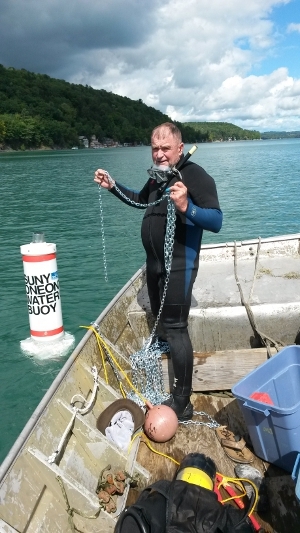 The clean-up was a community service project headed by The Lions Club with help from the OCCA and the SUNY Biological Field Station volunteer dive team. Read the full article here. 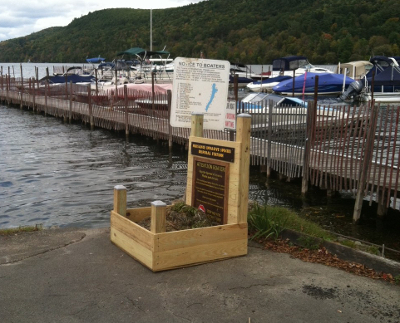 Otsego Lake was briefly mentioned by Kiyoko Yokota in the Northeast Aquatic Plant Management Societies recent newsletter. Read the full article here on page 8. 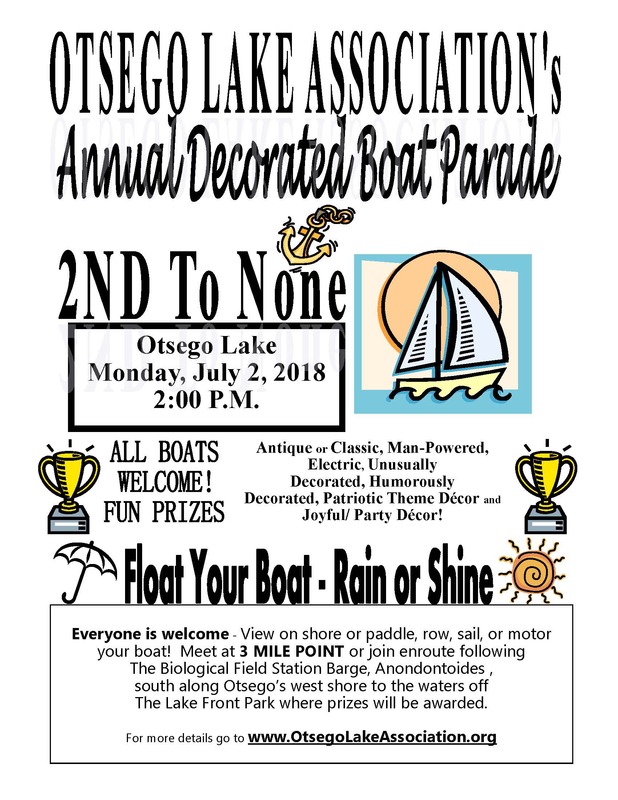 We now have a "OLA Welcomes You To Otsego Lake" flyer, for all renters staying on/near Otsego Lake (To All Motel Guests, Bed & Breakfast Guests, Camp Renters, Dreams Park Guests, Opera Guests, Seasonal Lake Residents, and Other Visitors). See the flyer here. Despite nearly triple digit heat index, there was proof that "We love our Lake". Boaters showed their "true colors". During this years "2nd to none" Boat Parade we gave out 5 prizes to some wonderfully decorated boats. In no particular order. Please see the below announcement of a talk that Kiyoko Yokota (SUNY Oneonta Professor, Technical Advisor for OLA) will give about the temperature monitoring buoy at 6pm on June 27 at the Clark Sports Center. Hope some of you can attend. Don't forget this boating season to CLEAN DRAIN TREAT. Kudos to the Village of Cooperstown for installing permeable surfaces as part of the Main Street sidewalk project in 2015. This educational sign is located on Main Street just west of the Baseball Hall of Fame. Tthe Otsego Lake Continuous Lake Monitoring Buoy (CLMB) has been deployed for the 2018 season. Professor Kiyoko Yokota, Researcher Paul H. Lord, and graduate student Sarah Coney were assisted by volunteers from OCCA, Leslie Orzetti & Danny Lapin, and BFS Dive Team volunteers, Lee Ferrara, Bjorn Eilertsen, and Wayne Bunn. Tom & Leslie Breiten facilitated our success as well. 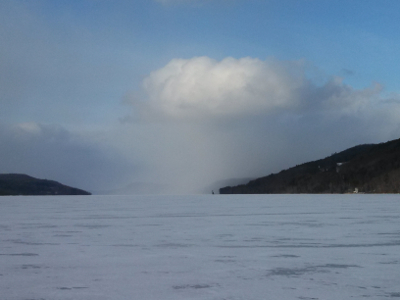 The buoy is streaming data here and we can watch Otsego Lake warm. 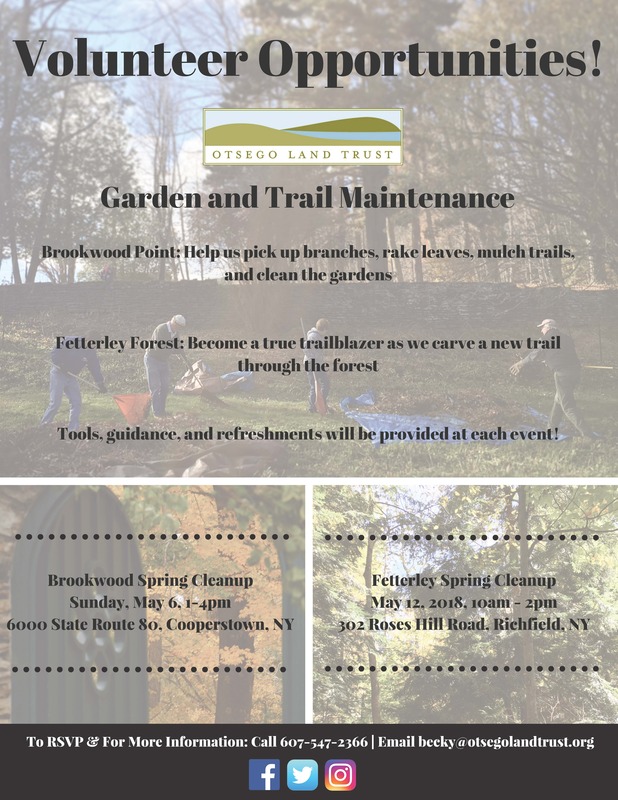 The surface temperature today was 43° F.
The Otsego Land Trust is hosting two volunteer spring cleanup days in May at two of their properties: Brookwood Point and Fetterley Forest. They are searching for volunteers to help them prepare both sites for the upcoming season. Please consider helping them out this spring. 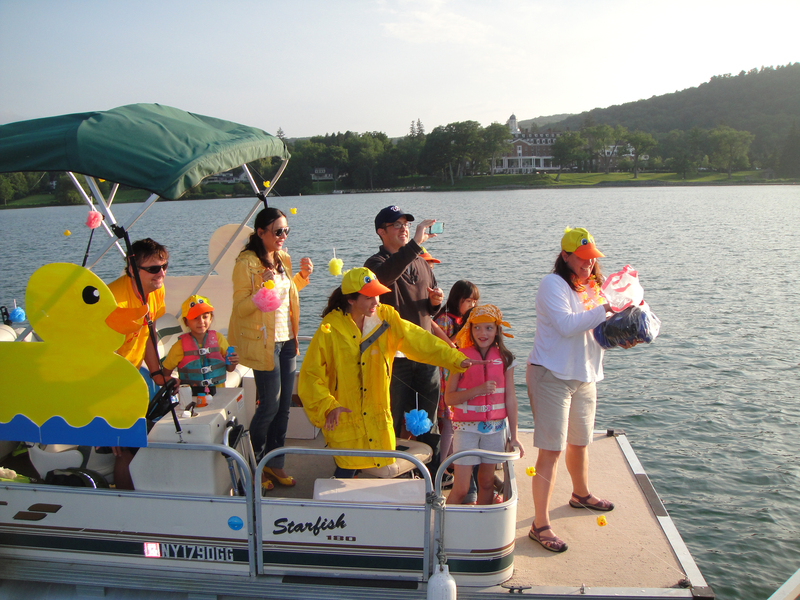 Lee Ferrara, Sarah Coney, Thomas Franzem, & Paul H. Lord deployed summer season no-wake zone buoys in Otsego Lake at Lake Front Park, 3-Mile Point, Bayside Inn, & Springfield Landing in Otsego Lake on Sunday, the 22nd. They were ably assisted by Wayne Bunn. The air was warm. The water was crisp & clear. 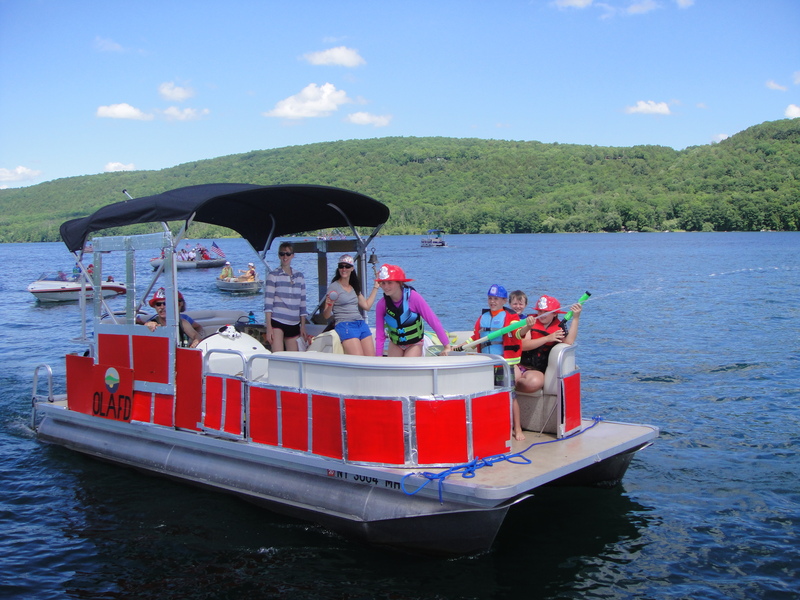 Otsego Lake is officially open for summer recreation. Past president and current Board Member Wayne Bunn sent in this photo today. 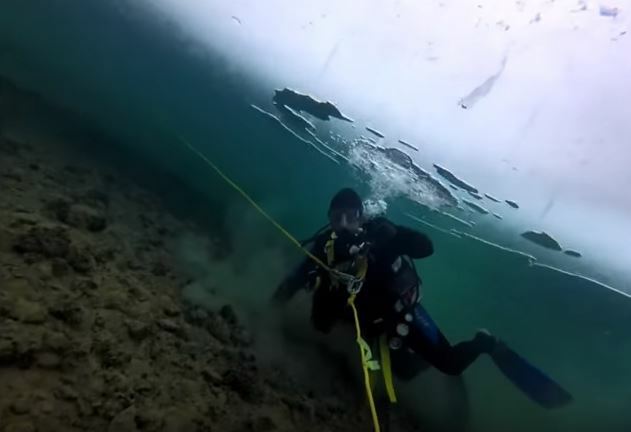 "Start of Ice Out"
A couple of great videos from the BFS volunteer dive team, filmed in 2015. 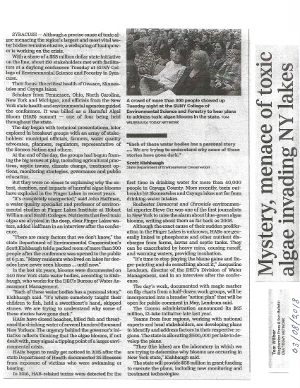 Mystery, menance of toxic algae invading NY lakes. Real-time data now available from the automated monitoring buoy. The real-time data can now be accessed here. During the summer of 2017 you may have noticed a new permanent floating object located in the middle of, and deepest (168 feet) part of the lake, just north of Five Mile Point. This object is the new fully automated research buoy (click here for real-time data) that was installed on July 27th, 2017 by Dr. Kiyoko Yokota, the BFS volunteer dive team and BFS interns. 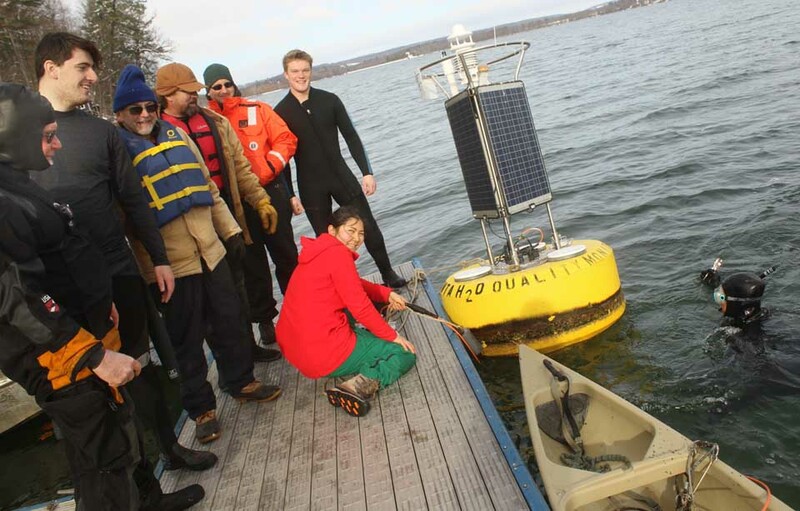 The research buoy will monitor 47 water quality and weather parameters and transmit them every 15 minutes via cell service to a remote server maintained by the buoy manufacturer. 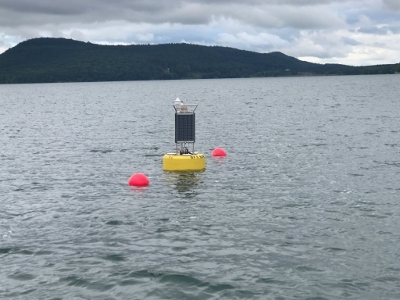 The data will then be downloaded and used in the ongoing research on Otsego Lake and to predict future water quality after a major rain or wind storm and to evaluate long term trends in relation with changing climate. The new buoy was funded by a $70,000 grant from the National Science Foundation and will replace the existing research buoy just off shore at Five Mile Point which had to be read manually about every two weeks. Additional funding sources include Otsego Lake Association; SUNY 4E Grant, SUNY Oneonta & Biological Field Station; U.S. Geological Survey -NYS Water Resource Institute. From Dive Master Paul Lord. "The light snow yesterday did not deter our divers and tenders. Springfield Landing and Lake Front no-wake zone buoys have been replaced, for the winter, with spar buoys. Alex Sessions (SUNY Oneonta undergrad & Advanced Diver) and Lord did the diving at Springfield Landing with OLA Director Wayne Bunn providing solicitous tending. 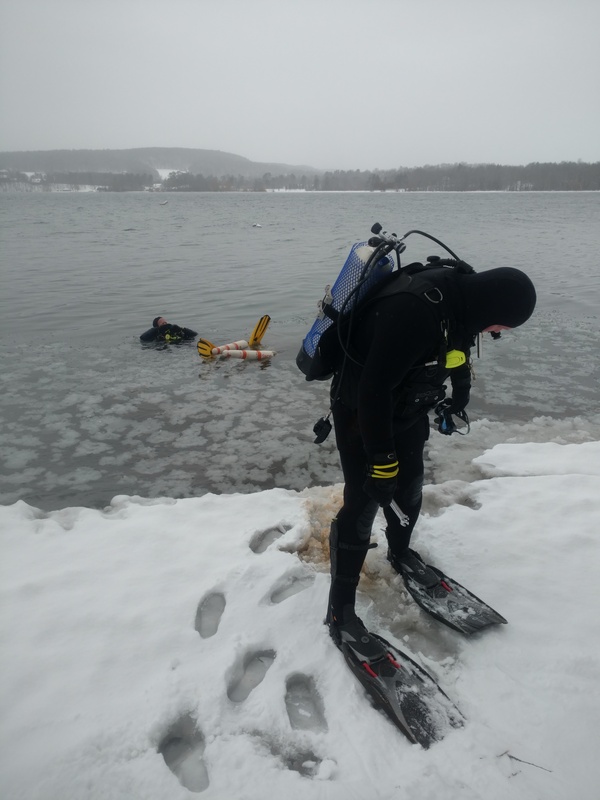 Lee Ferrara (Master Diver) supervised Krista Ransier (graduate student & dive instructor) and Sarah Coney (recent SUNY Oneonta graduate & Advanced Diver) in their dive at Lake Front with Colleen Parker (SUNY Oneonta grad student & certified diver) tending." A short video from today's dive can be found here. Additional pictures can be found here. 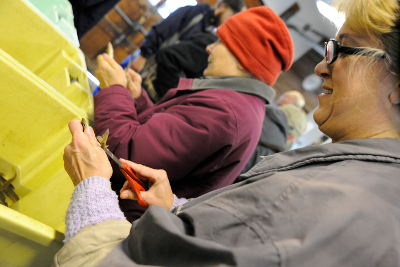 Find out what's been happening in and around Otsego Lake this year in "Our Glimmerglass" newsletter. 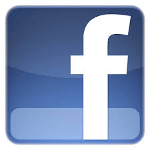 Read the latest version here. Lac Le Jeune, British Columbia, Canada, as studied by students from the British Columbia Institute of Technology. https://youtu.be/eNTRyzXYXqI or search for “FWR Winter Limnology” on Youtube.com. Lammi Biological Field Station, University of Helsinki, Finland – Lake Paajarvi is one of our “sister lakes” in the Global Lake Ecological Observatory Network (GLEON, gleon.org) that has a similar buoy based data collection program as in Otsego Lake. https://youtu.be/7iRDYS_P04s or search for “Lammi winter limnology” on Youtube.com. University of Wisconsin-Madison Center for Limnology, USA. They host young students at their Trout Lake Station for the North Temperate Lakes Long-Term Ecological Research (LTER) project's "Schoolyard," program. https://youtu.be/DbloXdW81ho or search for “LTER schoolyard” on Youtube.com. A UW-Madison researcher explaining the vertically elongated ice crystals that form when lake ice is melting. https://youtu.be/KpzkQ2zxXn0 or search for “lake ice candles” on Youtube.com. Therefore, it is especially risky to walk on melting lake ice! Glimmerglass Film Days, a showcase for powerful films reflecting humanity’s complex relationships with the natural world, will take place November 9-13, 2017 in Cooperstown, New York. The festival features screenings of several award-winning films, as well as encounters and collaborations with internationally known artists, activists and aficionados in a 5-day series enlivened by local food tastings, and optional trail hikes and bike tours, all designed to celebrate the natural and historic resources of the Cooperstown region. OLA is proud to sponsor "LOUISE EN HIVER". this year. For more information visit Glimmerglass Film Days. Quote from Paul Donnelly " Volunteers heading out to retrieve buoys at season’s end. 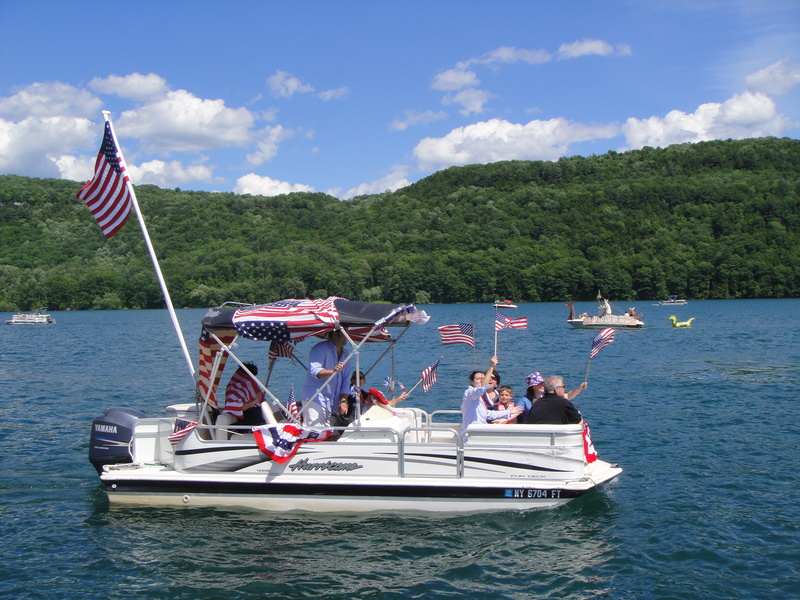 Another year of making Otsego Lake a safer place for recreational boating. Bravo!" Today we received a special announcement from the director of OCCA. Congratulations to Bob Sutherland. In 1989, OCCA established the Conservationist of the Year award to honor an individual, organization, business, or governmental body that has made a positive difference in environmental protection, preservation or education in Otsego County. I am pleased to announce that Bob Sutherland of The Clark Foundation – Mohican Farm has been named OCCA’s 2017 Conservationist of the Year. We will honor Bob at our first-ever Annual Picnic on Sunday, September 10 at Gilbert Lake State Park. 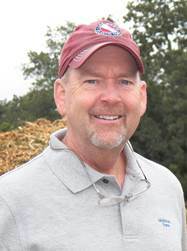 As manager of Mohican Farm, Bob is a leader in The Clark Foundation’s sustainability efforts, and promotes good conservation practices within the organization and the community. He established a composting operation at the farm that recycles thousands of pounds of food scraps and green waste each year, works to control invasive species with minimal pesticide use, and encourages the use of Mohican Farm as an educational resource. In addition, Bob serves on the Otsego Lake Association Board of Directors, volunteers with Growing Community, supports the Cooperstown Elementary School Kid Garden, and is a key member of the committee seeking to establish a county-wide composting facility in Oneonta. Come join us and help celebrate Bob Sutherland. We had a great meeting yesterday, thank you to Glimmerglass Festival and everyone who attended. Paul Donnelly a local photographer said the following about yesterday's meeting "This year’s annual meeting was quite a special occasion. Willard N. “Bill” Harman Professor and Director of the BFS talked about the 50-year journey of this remarkable institution. He captured the significant progress which has been made in improving the quality of the lake water. Today, it is by far the best it’s been in the last fifty years. He noted that the Otsego bass as well are now making a comeback. 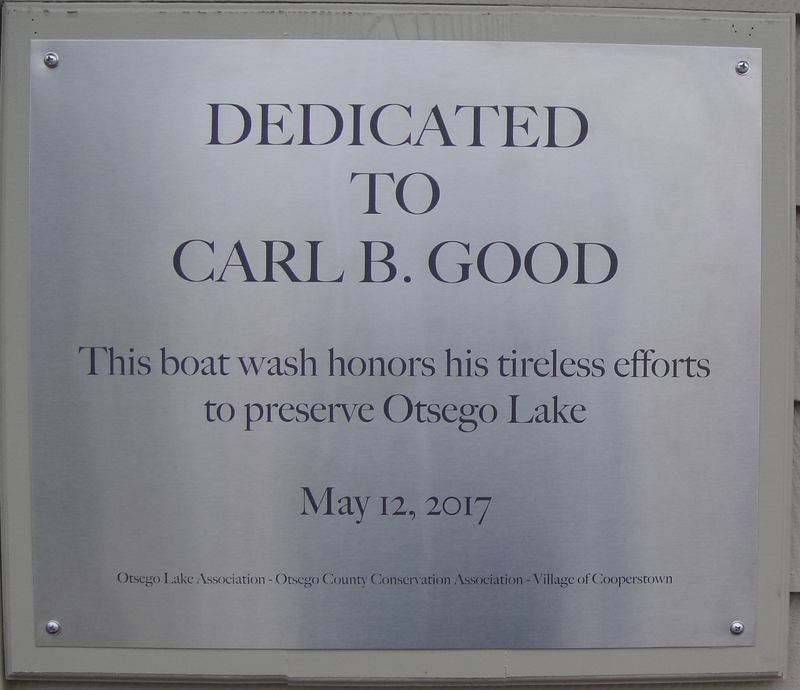 Later in the program, he was given the Lake Citizen Award - 2017 for his many efforts and genuine interest to ensure the future of Otsego Lake. Those attending gave him a well-deserved round of standing applause. Also speaking at this meeting was Bob Sutherland Mohician Farm Director. He talked about Springfield’s Swanswick's and Duke’s Oak Theaters history and their respective impacts being a part of Otsego Lake’s historical past. Nicely done and most interesting." Please consider joining us for our annual meeting on Saturday August 12th at the Glimmerglass Festival (Opera) from 8:30am-11:00am. Free coffee, donuts and other goodies will be available. For more details visit our events page here. The monitoring buoy was installed Tuesday on the surface in the middle, over the deepest part of the lake, off 5-mile point. 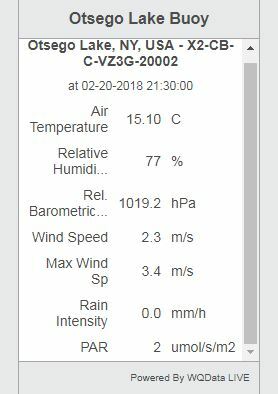 It officially went online and started recording data late last night. 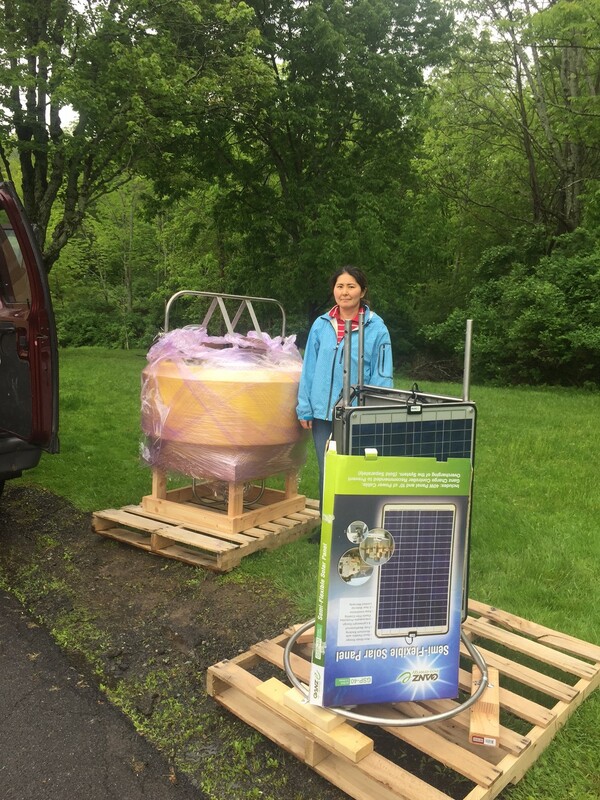 The buoy will help in our understanding of the lakes physical and chemical status throughout the year. Special thanks go to the 40 boats and a countless number of shoreline observers who participated in this year's boat parade. The pictures can be viewed here. 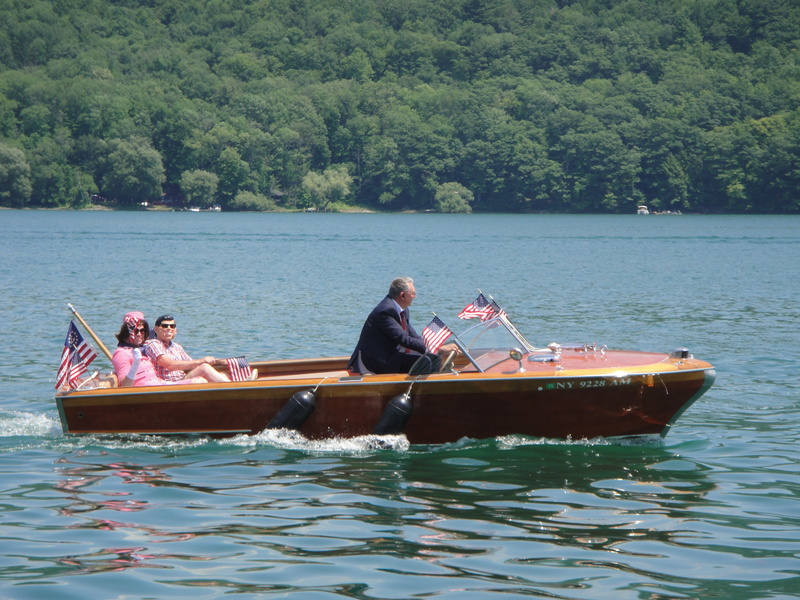 The following boats and families received a special prize for being voted one of the best of show. SUNY Oneonta Buoy has gone missing. 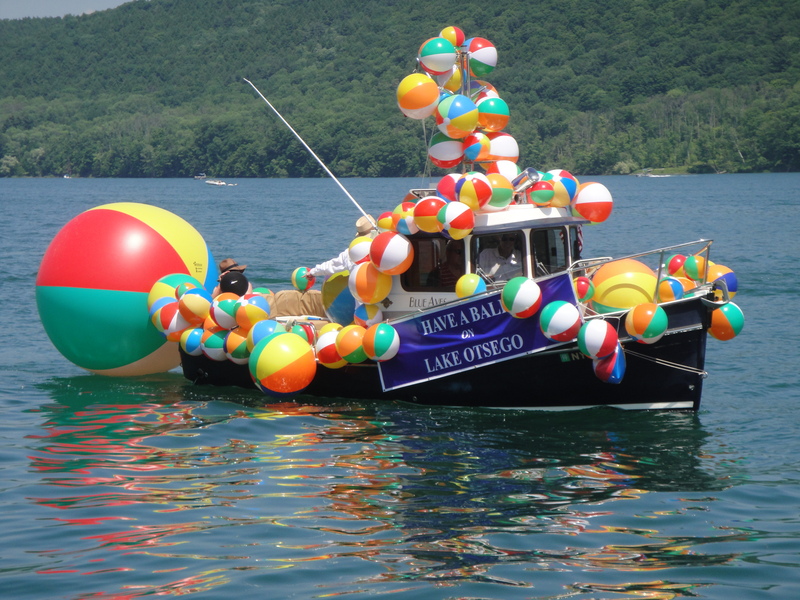 If anyone finds the SUNY Oneonta Water Buoy floating around Otsego Lake or on shore, please contact us at info@otsegolakeassociation.org. The buoy is similar to the 200-foot No-Wake Buoys but has "SUNY Oneonta Water Buoy" written on it. 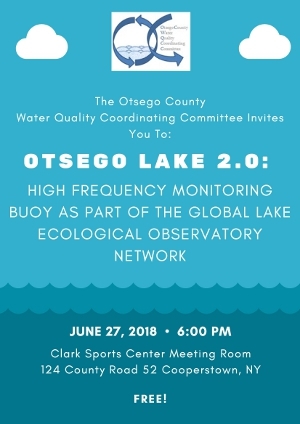 The SUNY Oneonta Biological Field Station and Otsego Lake Association are enthusiastic to announce that Otsego Lake has joined the 21st century in lake monitoring. The monitoring buoy will take a multitude of parameters from multiple depths at pre- set intervals and will be placed on the surface in the middle, over the deepest part of the lake, off 5-mile point. 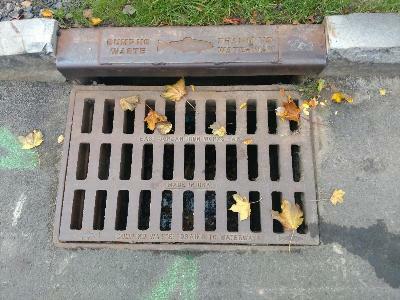 There are only a handful of these devices spread around New York State, mainly in some of the finger lakes and NYC reservoirs. 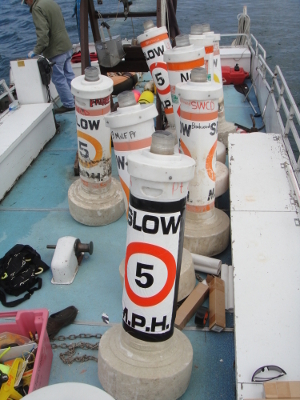 The buoy will help in our understanding of the lakes physical and chemical status throughout the year. 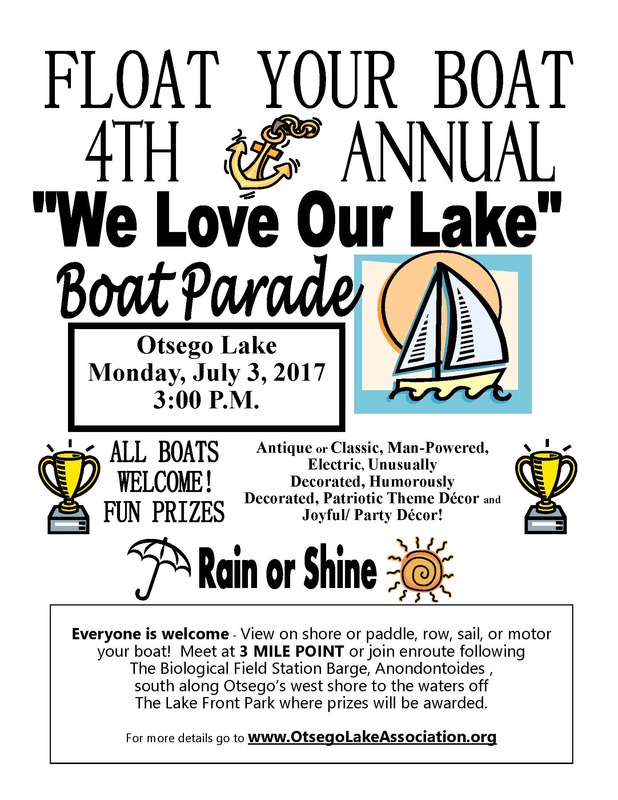 We hope you can join us for our 4th annual "We Love Our Lake" Boat Parade on Monday July 3rd, 2017 3:00pm at 3-Mile point. Over 50 folks attended the Carl B. Good boat wash dedication today. Carl B. Good was an instrumental part of the boat inspection program, he served on the OLA BoD and several committees to preserve the village and its environment. WKTV, Channel 2 of Utica also attended and put together a nice clip of the event, that was aired on tonight's 11:00pm news. Click on the image below for the video and click here for the news article. 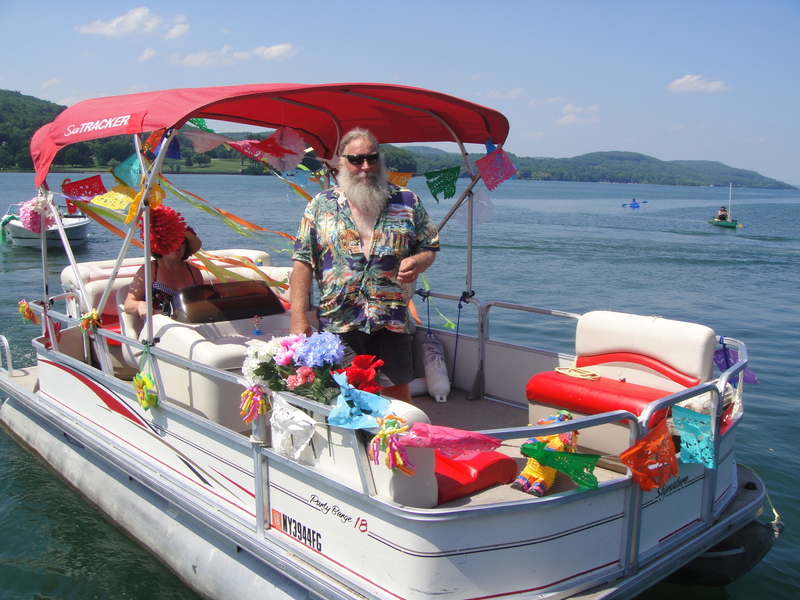 EVENT REMINDER: BOAT WASH DEDICATION - Please join us on Friday May 12th 5:00pm at the new Carl B. Good boat wash station located on Fish Road next to Lakefront Park. Carl B. 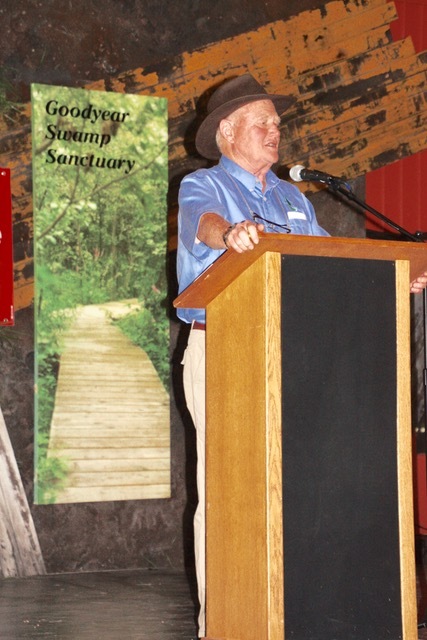 Good was an instrumental part of the boat inspection program, he served on the OLA BoD and several committees to preserve the village and its environment. • Plants & animals that can change your water. • Laws used to protect against invasions. • Where these invaders hide & how to sniff em’ out. 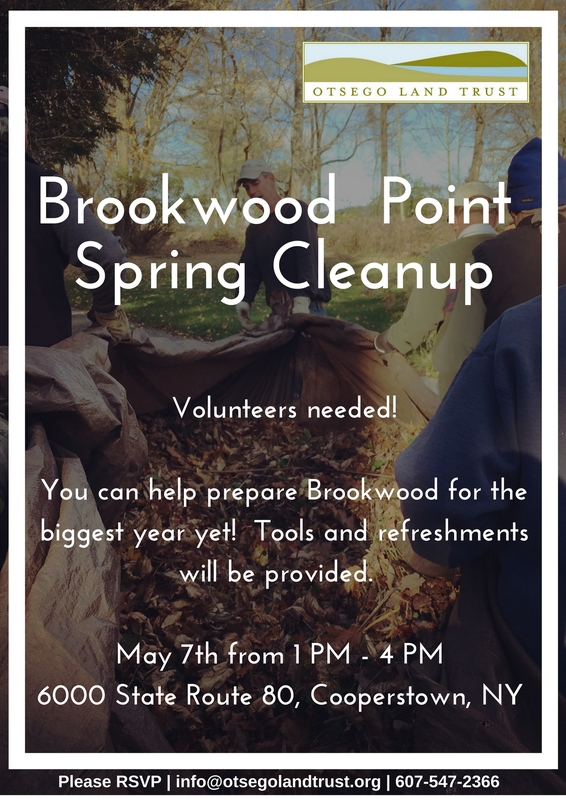 Otsego Land Trust - The Otsego Land Trust is looking for volunteers to help with their annual Brookwood Point spring cleanup event on Sunday May 7th 1pm-4pm located at 6000 State Route 80, Cooperstown, NY. Tools and refreshments will be provided. Please RSVP to info@otsegolandtrust.org. 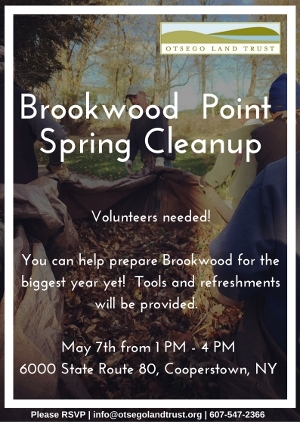 Additionally, their grand Brookwood Point reopening event will be Saturday May 20th 12pm-5pm with food, music, programs and much more. Please mark your calendars and join us on Friday May 12th 5:00pm at the new Carl B. Good boat wash station located on Fish Road next to Lakefront Park. Carl B. 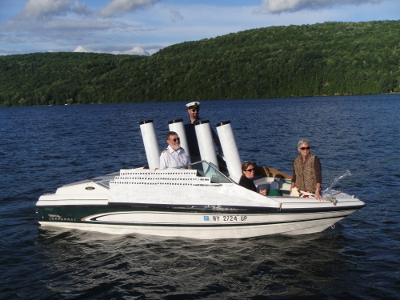 Good was an instrumental part of the boat inspection program, he served on the OLA BoD and several committees to preserve the village and its environment. Greetings NYSFOLA Members! 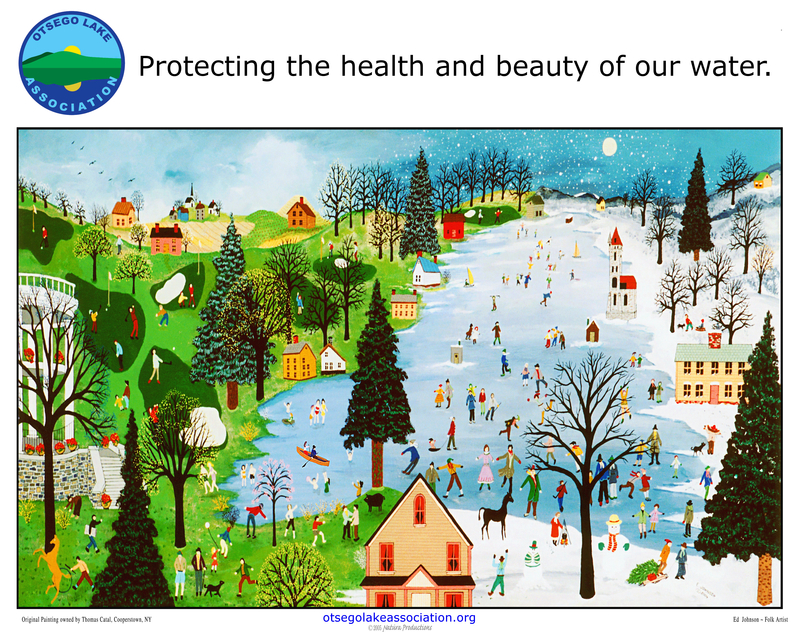 The DRAFT agenda for the 34th annual NYSFOLA Conference "Lake Ecology and Human Impacts" is now on our website at www.nysfola.org. The conference will be held May 5-6, 2017 at White Eagle Conference Center in Hamilton, NY. We have changed the format this year so that the annual banquet will take place on the evening of Friday May 5th, and we will end the conference Saturday afternoon - with an optional Saturday evening lodging package for those who may need it. Topics this year, as always, cover a variety of lake related topics including onsite wastewater inspection programs, dam safety, invasive species, lake and watershed management, citizen science, and more!!! We want to draw special attention to Friday's session designed to help lake associations navigate the rules for not-for-profit organizations. We think that many of our members will benefit from this important discussion. NYSFOLA Welcomes Carrie Pollack, Esq. from Hancock and Estabrook, LLP to discuss the somewhat confusing rules for NY Not-for-Profits including Lake Associations. We are still working on the details of the session, but here’s what we anticipate: Corporate Characteristics of Nonprofits – State Perspective Tax Exempt Status – Federal Perspective Regulating Agencies – Who They Are & What They Care About Board Responsibilities – Record keeping responsibilities, Fiduciary duties, What is an officer? What is a director? What is proper role? Committees, Board member orientations Changes in the Law – Conflicts of interest, Audit requirements. We look forward to seeing you all once again at our annual gathering. Don't forget to bring something for the Silent Auction! 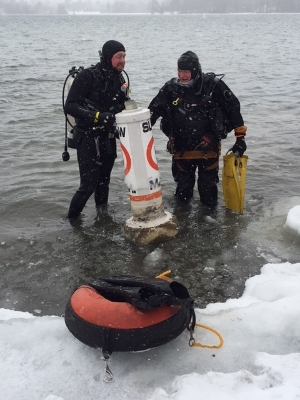 Five divers and two tenders braved the cold, windy, snowy and icy conditions Saturday to remove the last two (Springfield landing and Cooperstown lakefront) 5mph no-wake buoys from the lake. See all the pictures here. 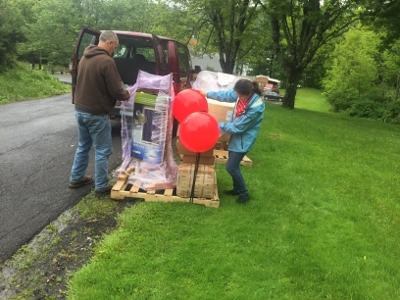 Maggie Doolin & Colleen Parker (SUNY Oneonta graduate students) assisted Paul Lord in deploying the winter buoys which now hold up Professor Yokota's water monitoring sensors, at 5-Mile apt, in 100' of water. Find out what's been happening in and around Otsego Lake this year in our Fall "Our Glimmerglass" newsletter. Read the latest version here. 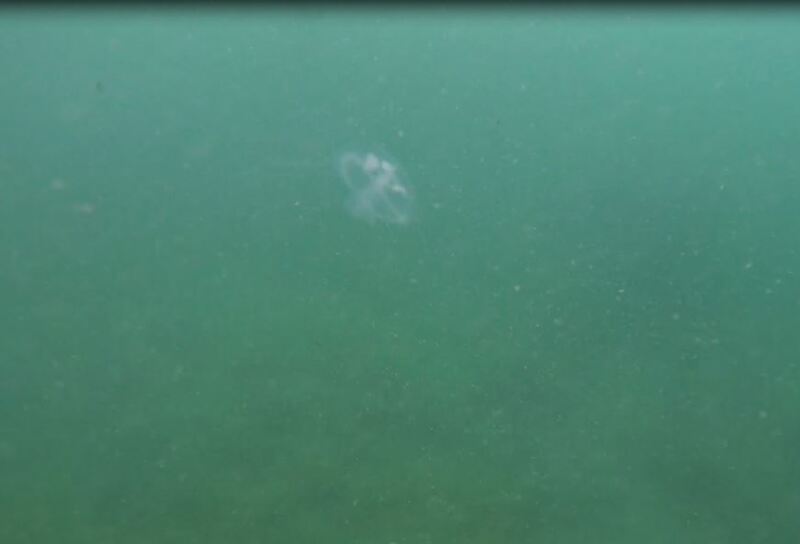 Click image below for a jellyfish video that was taken this summer on Otsego Lake. Glimmerglass Film Days, a showcase for powerful films reflecting humanity’s complex relationships with the natural world, will take place November 10-14, 2016 in Cooperstown, New York. The festival features screenings of several award-winning films, as well as encounters and collaborations with internationally known artists, activists and aficionados in a 5-day series enlivened by local food tastings, and optional trail hikes and bike tours, all designed to celebrate the natural and historic resources of the Cooperstown region. OLA is proud to sponsor the film Rango this year. For more information visit Glimmerglass Film Days. We now have a water buoy installed off the shore of 5-mile that will continuously collect water temperature and light intensity data at 15-minute interval at various depths, 24/7. 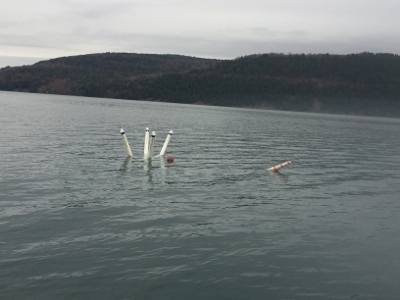 Most of the new system was installed by the BFS Volunteer Dive Team, led by Paul Lord and Jim Vogler (Lecturers of Biology, SUNY Oneonta) and assisted by SUNY Oneonta undergraduates Zach Piper and Alex Sessions. Two BFS interns from Laurens Central School, Kayla Johnson and Connor Lewis March Sr., completed installation of the sensors under supervision by Kiyoko Yokota (Assistant Professor of Biology, SUNY Oneonta). See the press release here. 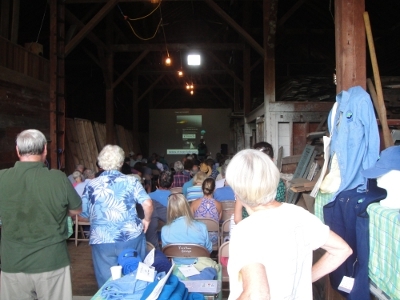 Over 60 people joined us at the Mohican Farm for an informative morning of lake oriented talks. See all the pictures here. Photo credit: Scottie Baker of Natúra Productions. We hope you can join us for our 2016 Annual Meeting at the Mohican Farm in Springfield Center on Saturday August 13th, 8:30am Coffee & Donuts, Meeting 9:00am-11:00am. Stay after the meeting for a Tour of Historic Mohican Farm and Spaulding Estate Formal Gardens. Learn more here. After many months of hard work by OCCA, OLA, Village of Cooperstown, Local contractors and many others, we now have a fully functioning Boat Wash Station at Lake Front Park in Cooperstown. 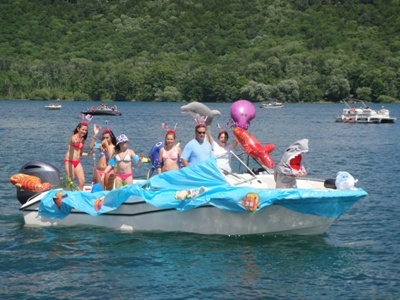 The third Annual "We Love Our Lake" boat parade was a huge success. 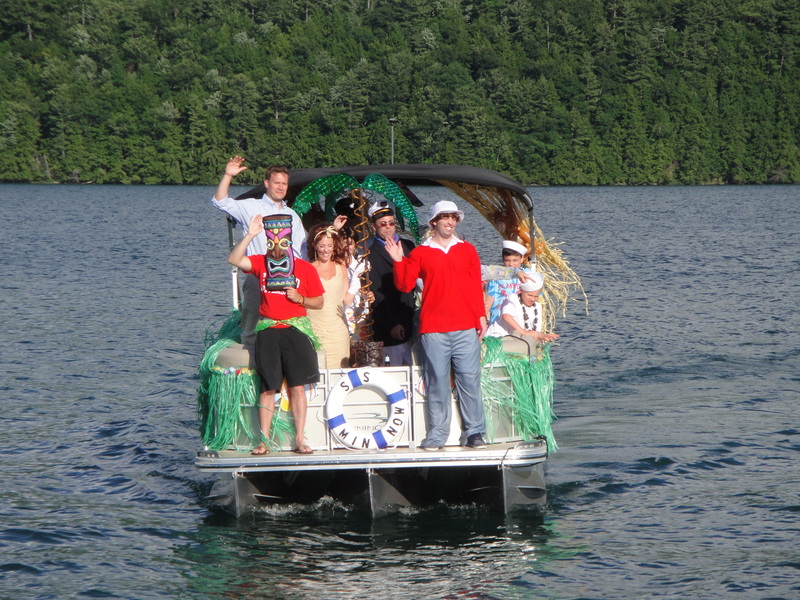 Many thanks to the boat parade committee for all their hard work in organizing the event. 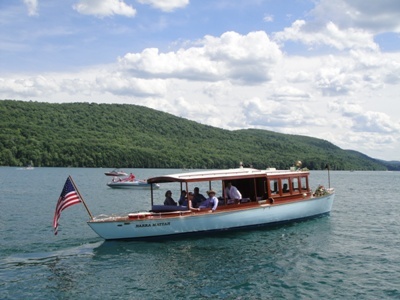 Special thanks to the 50+ plus boats that were congregated around 3-mile point and 100+ shoreline spectators who were scattered across 3-Mile Point, Sam Smiths Boatyard/Blue Mingo Restaurant, Otsego Sailing Club, Fenimore Museum, Cooperstown Country Club, Otesaga Hotel, Lake Front Park and a few private residencies. Some pictures of the parade have been uploaded click here. 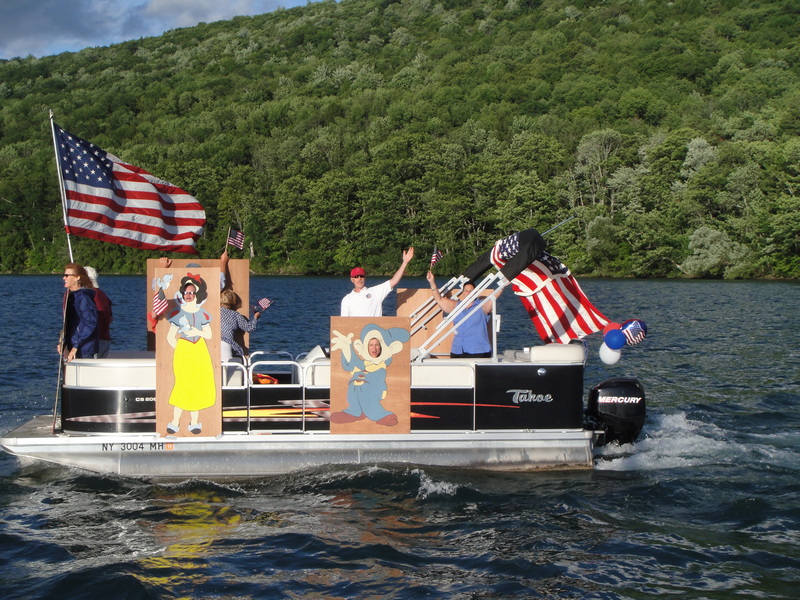 With so many amazingly decorated boats this year it was very difficult for the judges (Scottie Baker, Wayne Bunn, Joan Bunn, Chip Dunn & Timothy Pokorny) to choose just one winner in each category. Congratulations to the following winners. Man-powered: no participants, so we had two Humorous winners. 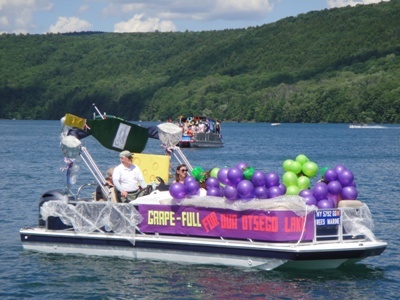 & "Grape-Full for Otsego Lake" - Rees family. 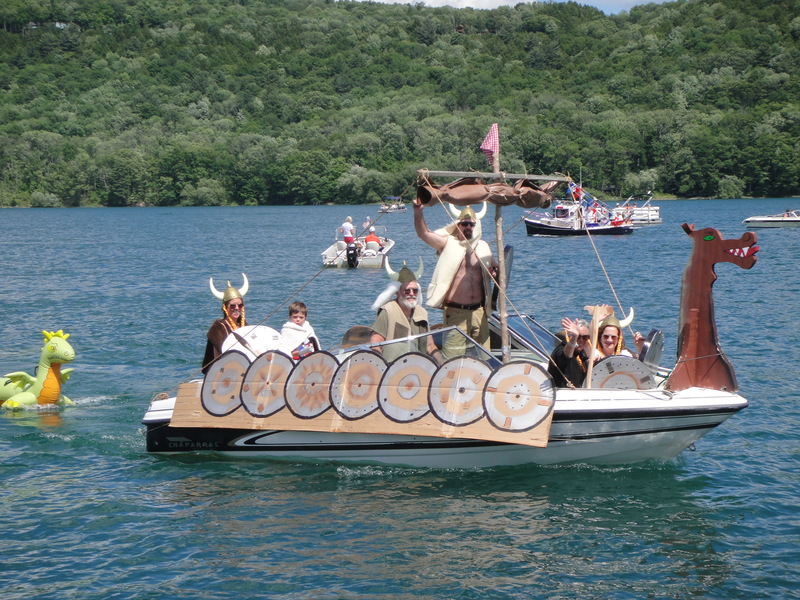 Grand prize/best of parade: "Viking Ship"
We hope you can join us for the "We Love Our Lake, Third Annual Boat Parade" this upcoming weekend. 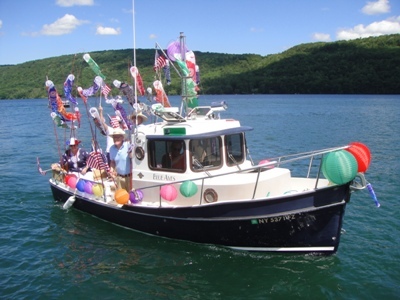 The parade is set for Sunday July 3rd, boats are to meet at 3-mile point at 3:00pm. Learn more here. 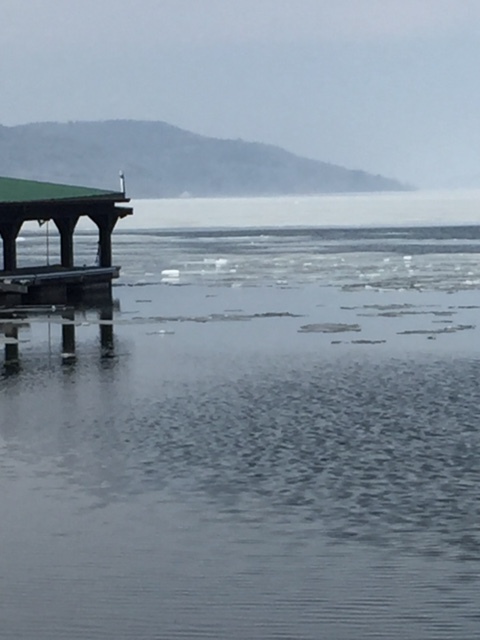 Find out what's been happening in and around Otsego Lake this year in our Spring "Our Glimmerglass" newsletter. Read the latest version here. 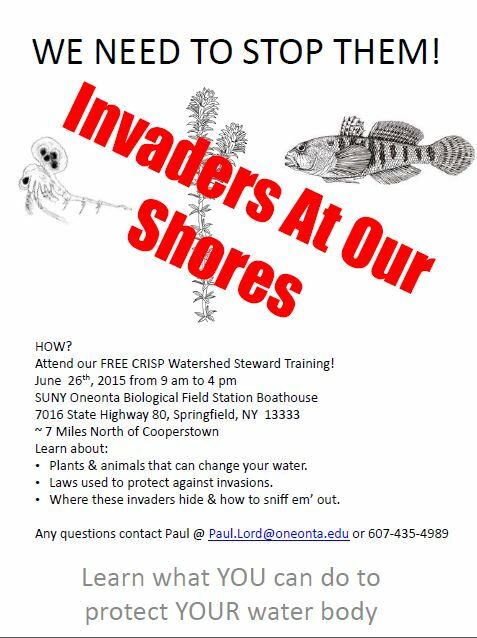 FREE aquatic invasive species identification training and CRISP watershed steward training provided by the Catskill Regional Invasive Species Partnership (CRISP) and the SUNY-Oneonta Biological Field Station is set for May 27th, 2016 9:00am-4:30pm. If you are someone who lives around or enjoys spending time in a small lake or pond, then consider volunteering to be a Watershed Steward which may be a perfect fit for you! 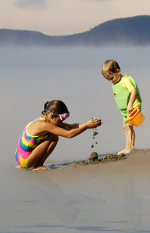 CRISP is looking for individuals to donate a few hours of their time at local lake and river boat launches and access points on weekends throughout the summer season from June through September. Boat Wash available in Springfield. 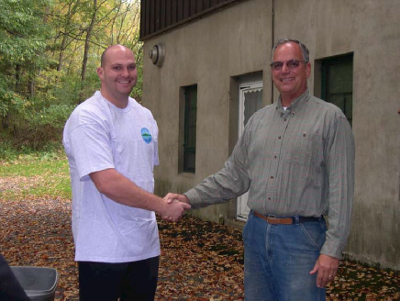 Randy Stocking has agreed to provide requests for boat washing at the Springfield Car Wash on Route 20. Boat owners should call 607-254-9016 or 607-434-3556. 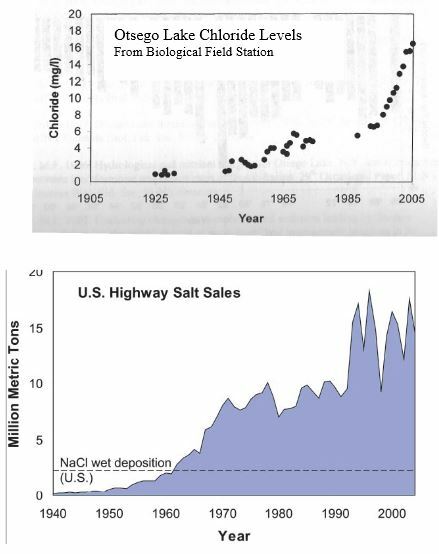 Someone will meet the boat owner at the car wash and they will wash the boat, trailer and vehicle with 160°F water which will kill all known aquatic invasive species that are threatening the local lakes. Rainbow smelt see resurgence in Otsego Lake. 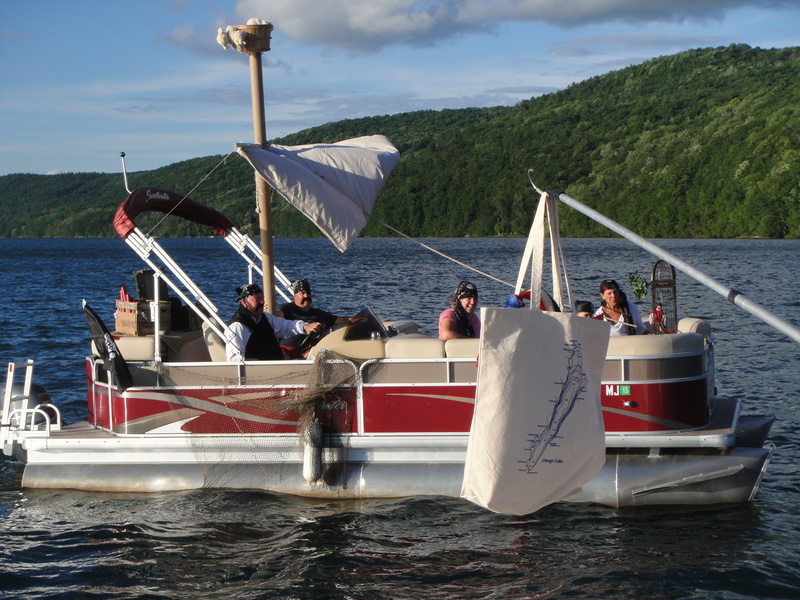 The Otsego County Conservation Association received more than $129,000 in grant funds to help combat aquatic invasive species in Canadarago and Otsego lakes. Learn more here. Plans for the 2016 annual meeting is coming along nicely. This year's meeting will be at the Mohican Farm/Spaulding Estate in Springfield on Saturday August 13th, 2016. Learn more here. 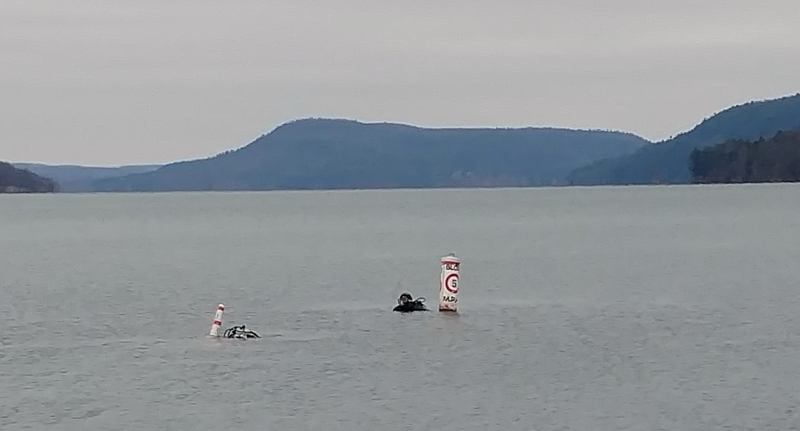 Volunteer divers Paul Lord (board member), Jim Vogler, Lee Ferrara, Chip Dunn and tender Timothy Pokorny (board member) removed the last two remaining 5 mph no-wake buoys from the lake today. 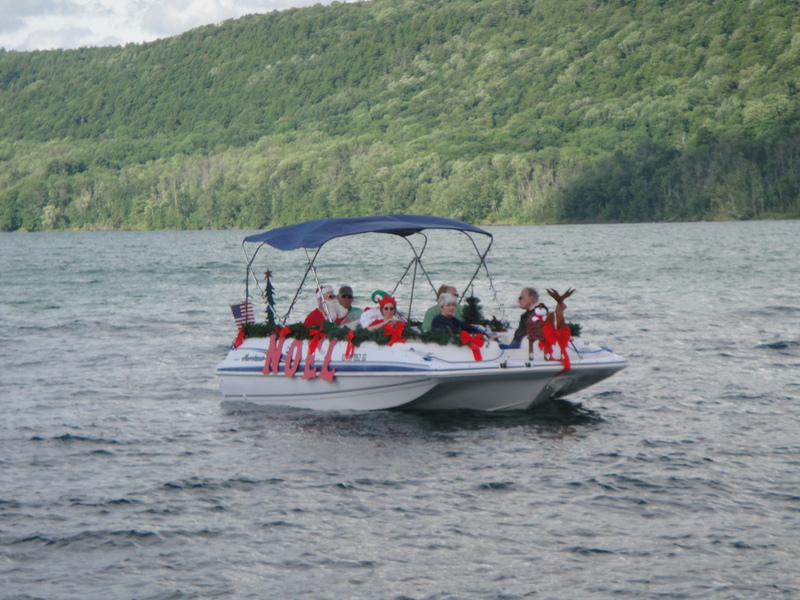 The Otsego Lake Association Board of Directors wishes you and your family a happy holiday season. 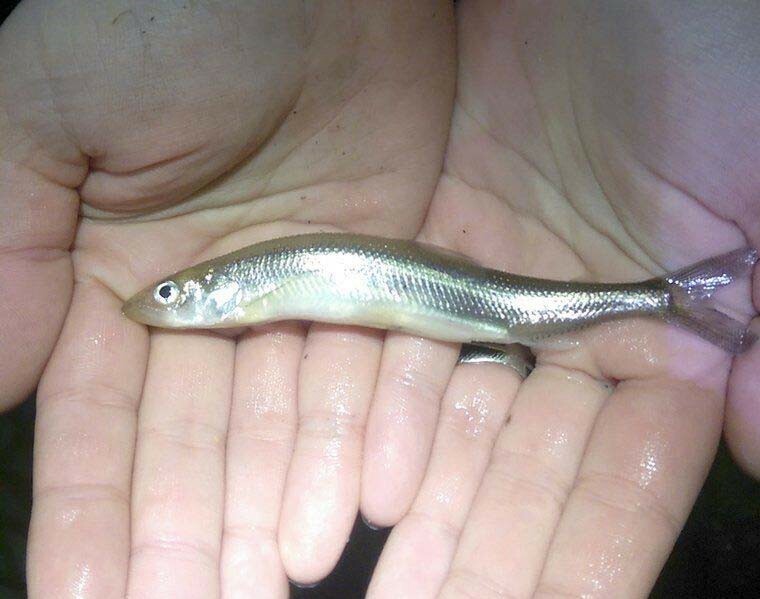 As some of you know NYSDEC, SUNY Oneonta and SUNY Cobleskill are currently working on bringing the Otsego Bass (Lake Whitefish) back through spring fry stocking (early May) and constructing spawning reefs. This fall they were successful in capturing 18 adult whitefish. 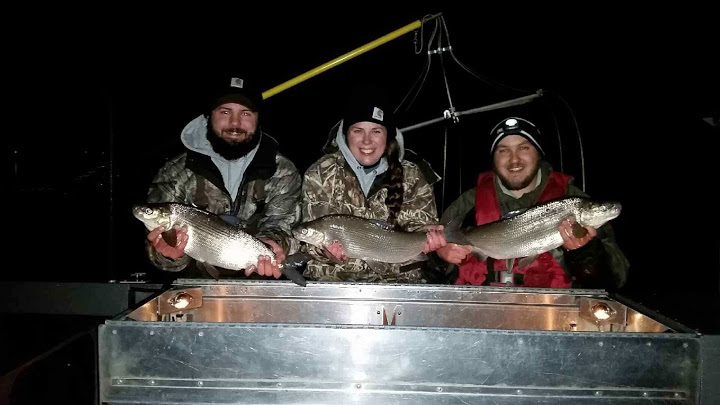 Most of the fish were males in the 20-24” range. SUNY Cobleskill were able to squeeze the 3 females collected, roughly 72,000 eggs with an estimated 80% (57,000 eggs) becoming fertilized. There was a small write-up on the front page of yesterday's Daily Star. Read the story here. A very interesting article about Lake Whitefish icefishing on Otsego Lake in the 1960's can be found here. At the Board of Director’s meeting today Mickie Richtsmeier presented Carl Good with a framed photo of Otsego Lake for his long-time association with, and commitment to, OLA. Congratulations Carl! Glimmerglass Film Days, a showcase for powerful films reflecting humanity’s complex relationships with the natural world, will take place November 5-9, 2015 in Cooperstown, New York. The festival features screenings of several award-winning films, as well as encounters and collaborations with internationally known artists, activists and aficionados in a 5-day series enlivened by local food tastings, and optional trail hikes and bike tours, all designed to celebrate the natural and historic resources of the Cooperstown region. OLA is proud to be part of the sponsors this year. For more information visit Glimmerglass Film Days. This year's annual meeting was another huge success. Special thanks to the Otsego Golf Club for opening their wonderful clubhouse for our meeting. We'd like to thank all the excellent speakers we had this year on Shaping Otsego Lake: Roads, Docks and Dams, Drones Monitoring Mud Flows on Otsego Lake, Anticipated Resurgence of Otsego Bass, Otsego Golf Club: Past, present, future & the new proposed boat wash station at Lake Front Park. Plans have been finalized for this year's annual meeting. Main Topic: "Shaping Otsego Lake: Roads, Docks and Dams" presented by Dr. Cindy Falk and Dr. Will Walker of Cooperstown Graduate Program, SUNY Oneonta. This year we are meeting Saturday August 8th at the Otsego Golf Club 144 Pro Shop Drive, Springfield Center, NY 13468 (entrance on State Highway 80). Special thanks go out to Brewery Ommegang who made a $1,500 donation to the BFS volunteer dive team. OLA has facilitated the delivery of a contribution from Ommegang Brewery to the Otsego County Soil & Water Conservation District for use by the Biological Field Station Volunteer Dive Team for work on Otsego Lake including maintenance and deployment of the no-wake zone buoys that protect Otsego Lake shorelines. 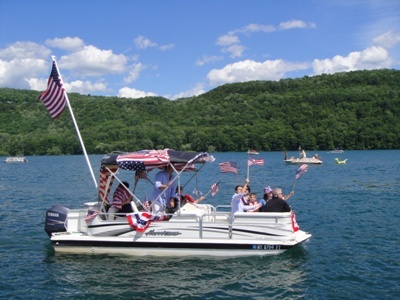 "We Love Our Lake, Boat Parade"
The second Annual July 4th Otsego Lake boat parade was a huge success. 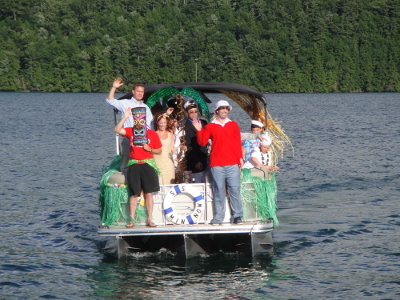 Many thanks to the boat parade committee for all their hard work in organizing the event. 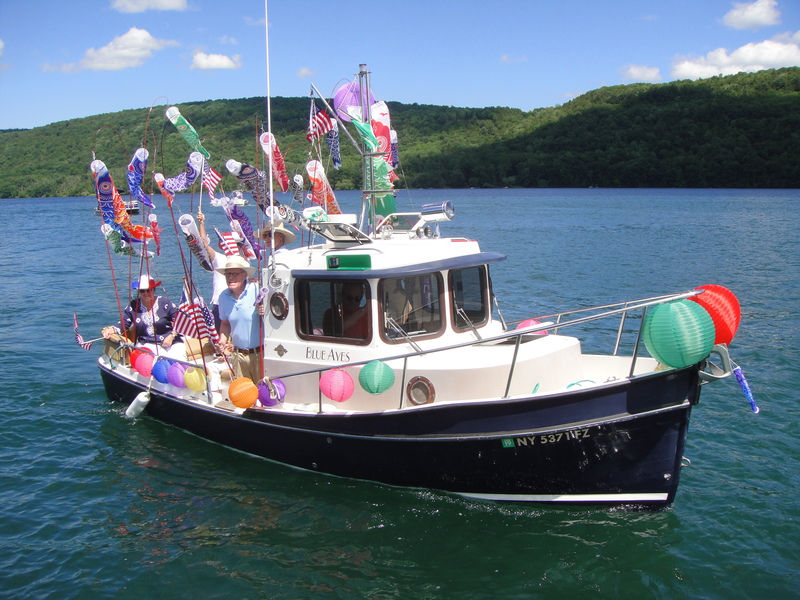 Special thanks to the 25 plus decorated boats that participated and 125 plus shoreline spectators who were scattered across 3-Mile Point, Sam Smiths Boatyard/Blue Mingo Restaurant, Otsego Sailing Club, Fenimore Museum, Cooperstown Country Club, Otesaga Hotel, Lake Front Park and a few private residencies. Some pictures of the parade have been uploaded click here. 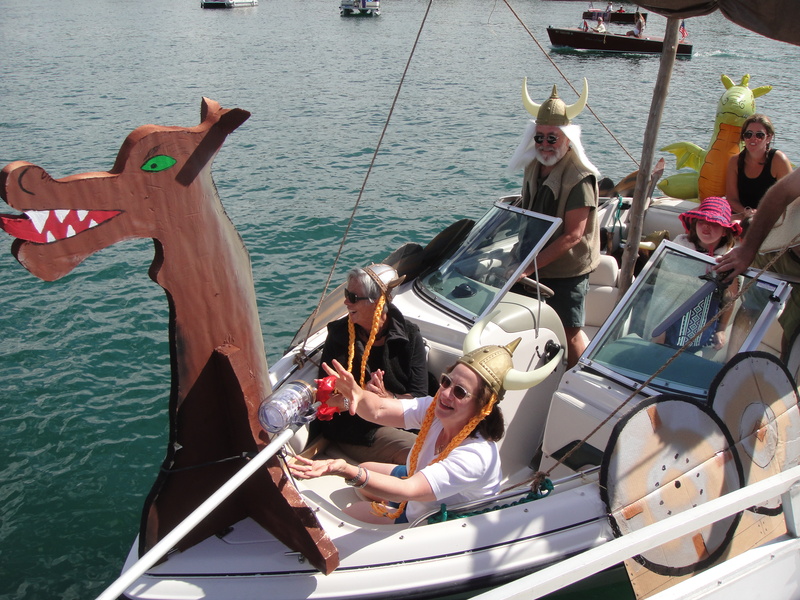 With so many amazingly decorated boats it was very difficult for the judges (Scottie Baker, Wayne Bunn, Joan Bunn & Timothy Pokorny) to choose the winners. Congratulations to the following winners. Man-powered: no participants, so we had two Patriotic winners. & "God Bless America" - Dykstra family. 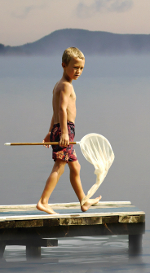 FREE Invasive Species Training - June 26th, 2015. 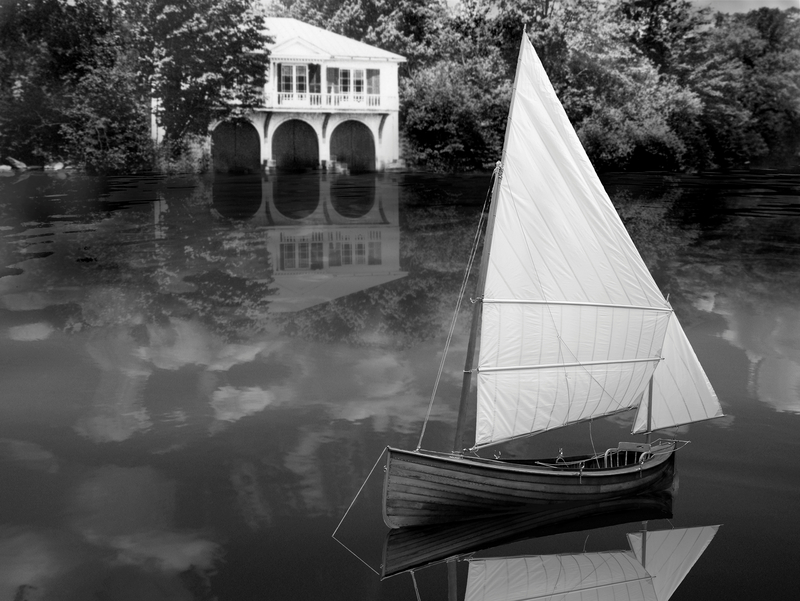 Learn how to become a steward for your lake. Spend a day with BFS staff learning about aquatic invasive species, how to prevent their spread & boat inspection procedures. •Plants & animals that can change your water. •Laws used to protect against invasions. •Where these invaders hide & how to sniff em’ out. Any questions contact Paul @ Paul.Lord@oneonta.edu or 607-435-4989. 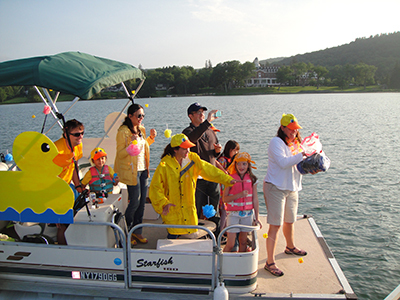 Now called the Otsego LAKES Festival, this event is traditionally a day of educational outreach with a focus on water quality. 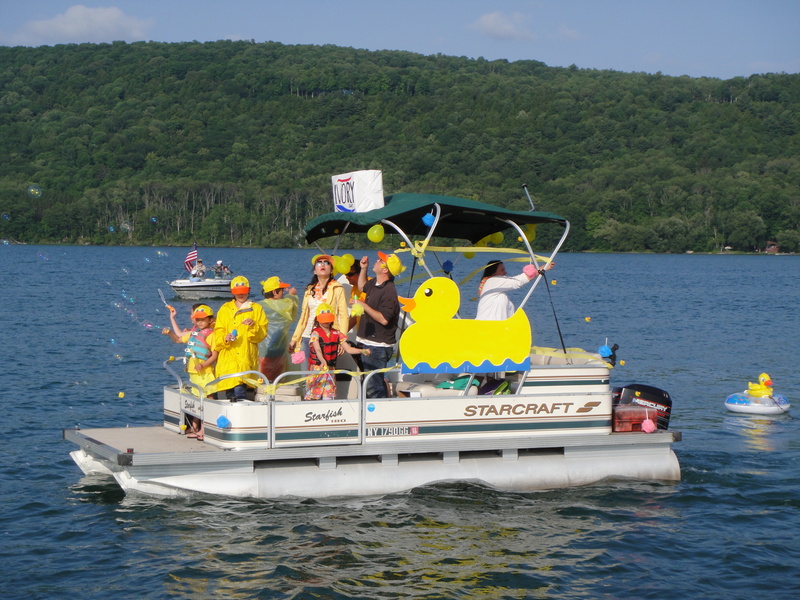 Once a celebration that recognized Otsego Lake and its vital role to the region as the headwaters of the Susquehanna River, the festival focus has been expanded to highlight the importance of Otsego County’s other major water bodies, including Canadarago and Goodyear lakes. This year's event is Saturday July 11th, 2015. 12:00pm (Noon)-4:00pm More details available here. 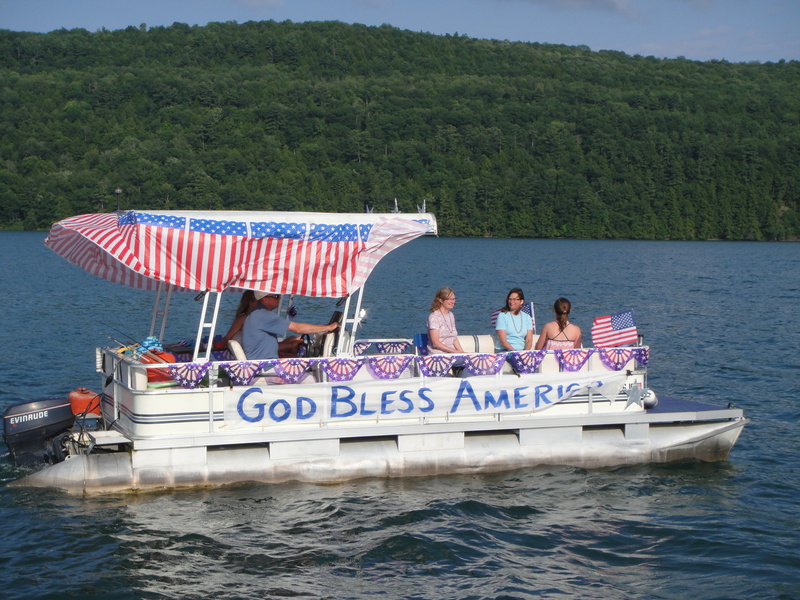 Plans for 2015 "We Love Our Lake, Annual Boat Parade" have been announced. The grand marshal this year is Paul Lord. Quote: "While I do spend considerable time on and near Otsego Lake, there are so many focused-on Glimmerglass that I was truly surprised by this honor. I only hope that my day of grand-marshalling can bring positive attention to all who work to protect Otsego Lake. 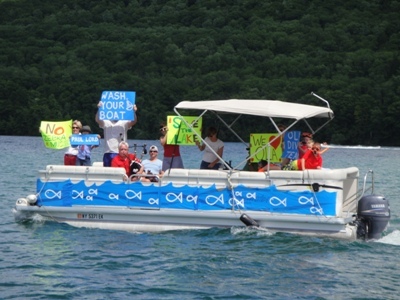 I want to highlight the good works of the SUNY Oneonta Biological Field Station (BFS) and the BFS Volunteer Diver Team. 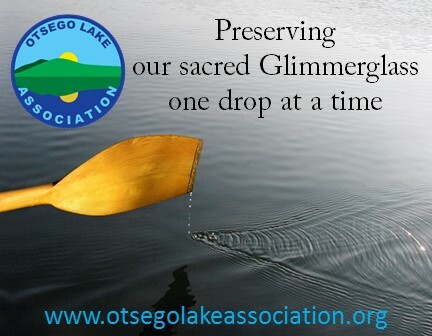 There is much to be done to protect our local gem, Otsego Lake. OLA -- and Otsego Lake -- needs many partners." Find our more here. 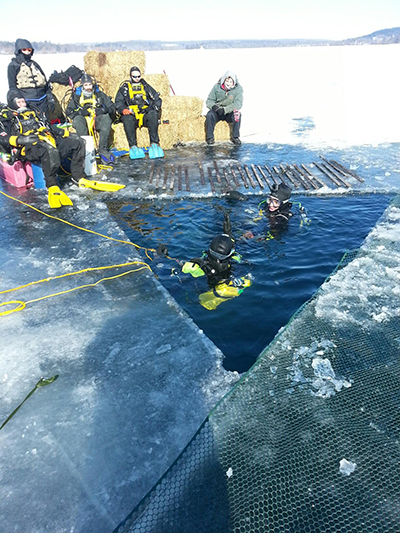 Paul Lord (right side) & Lee Ferrara (left side) braved the icy waters of Otsego Lake to install a 200-foot No-Wake Buoy. We celebrated, on Sept 2, 2014, when Governor Cuomo signed the new Aquatic Invasive Species spread prevention bill. 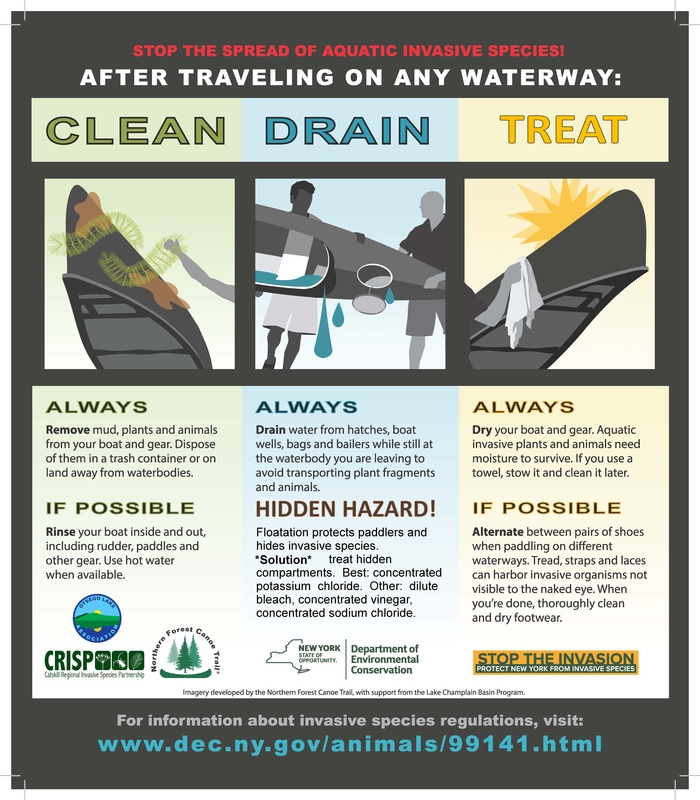 The new law differs from previous regulations in that it applies to "all public waters", not just NYSDEC waters and requires boats and floating docks be cleaned prior to launch. A copy of the law is posted here. NYSDEC didn’t know how the bill might look when passed or if the bill would be signed and, so, did not have implementing regulations prepared. The new law is for launching only and differs from existing DEC regulations. DEC is currently developing draft regulations to implement the new law. The new regulations will contain “a suite of spread prevention actions that watercraft operators can take before launching. 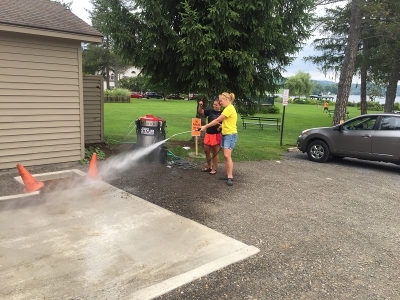 They will be released for public comment, likely in early summer, and are expected to take effect in the fall.” OLA has obtained permission from the Village of Cooperstown to build a steam cleaning station in Lake Front Park to help implement the new law on Otsego Lake. 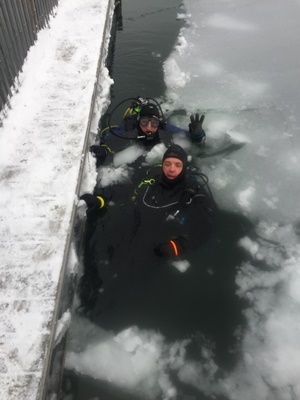 The Volunteer Dive Team had another successful ice dive this winter. Board of Directors winter meeting. Things are really coming together for 2015. 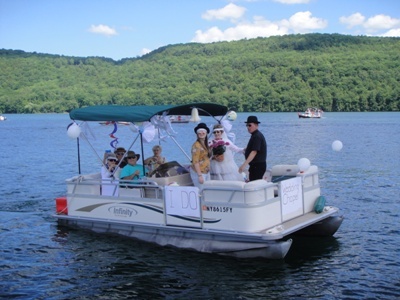 The annual meeting is Saturday August 8th, 201 at the Otsego Golf Club on the north end of Otsego Lake. Another fun filled boat parade will be on Saturday July 4th, 2015. Be on the lookout for new publications and new projects that help protect the lake. 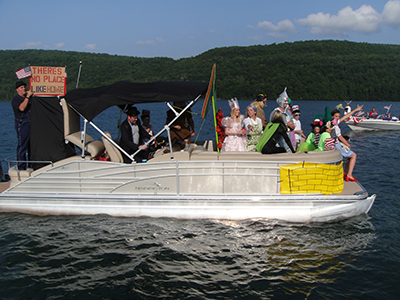 Click events to find out more about the boat parade and annual meeting. Ommegang Brewery generously donated $2,000 to OLA to help fund the volunteer dive team. The volunteer dive team is responsible for maintaining the no wake buoys on Otsego Lake. 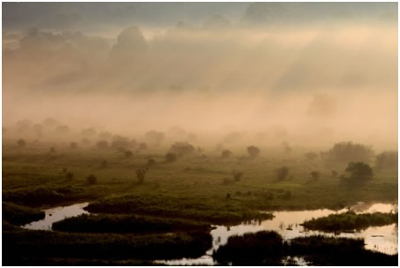 Glimmerglass Film Days, a showcase for powerful films reflecting humanity’s complex relationships with the natural world, will take place November 7-9, 2014 in Cooperstown, New York. 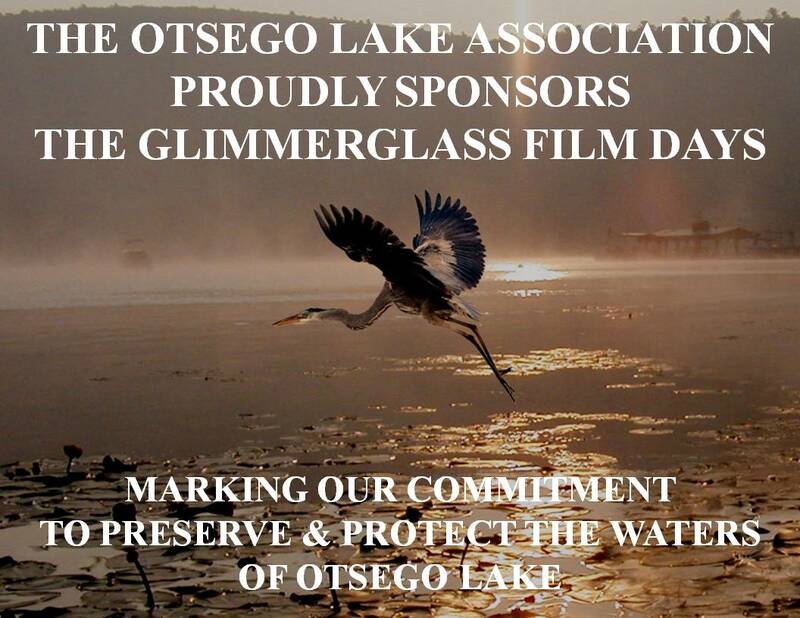 For more information visit Glimmerglass Film Days. Route 80 road repairs. OLA releases a position paper outlining the reasons for our opposition plus four suggested design alternatives for DOT to re-evaluate and then implement. "OLA STRONGLY OPPOSES NYSDOT’s RIP RAP DESIGN ALTERNATIVE". 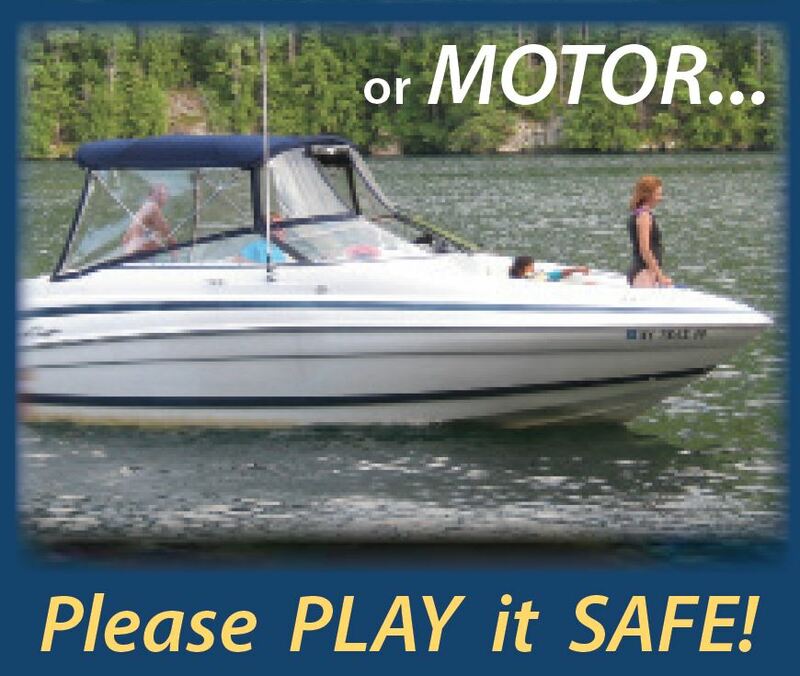 on our Rules of the Road - Boater Safety brochure. If your photo is used, you get one FREE OLA t-shirt. Limit one entry/photo per person. Entries must be submitted via email by 5:00pm Tuesday September 30th, 2014 to be eligible. Please provide name & additional contact information so we may contact the winner and provide photo credit for the photo used. If more than one photo is submitted only the first photo will be considered for prize. OLA is not responsible for lost or misplaced entries. Attention photographers!! 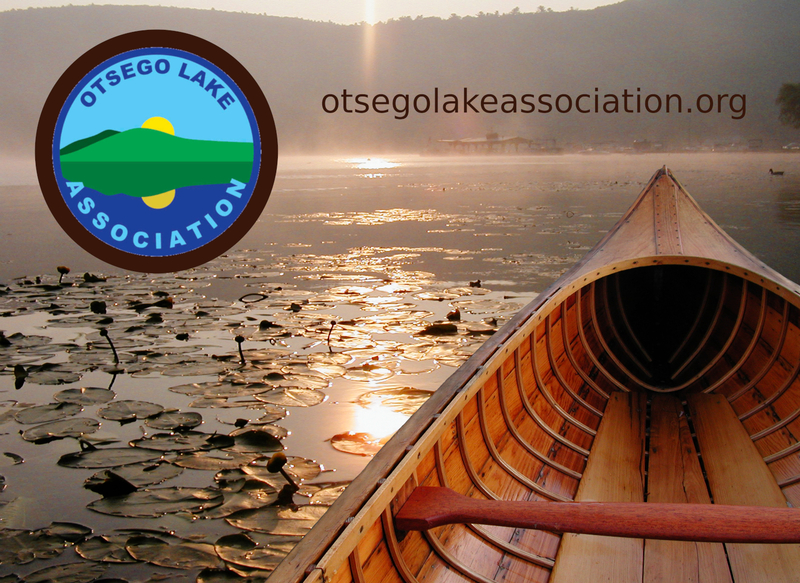 Submit YOUR best photo of our Annual Meeting held on August 9th, 2014 at Camp Minnetoska to info@otsegolakeassociation.org. If your photo is used on our website or other OLA promotions, you get one FREE OLA t-shirt. Limit one entry/photo per person. Entries must be submitted via email by 5:00pm Tuesday September 30th, 2014 to be eligible. Submitted photos must be used by December 31st, 2014 to receive prize. After December 31st, 2014 OLA reserves the right to use all photos on our website and/or promotions without awarding a prize. Please provide name & additional contact information so we may contact any winners and provide photo credit to each entry. If more than one photo is submitted only the first photo will be considered for prize. OLA is not responsible for lost or misplaced entries. 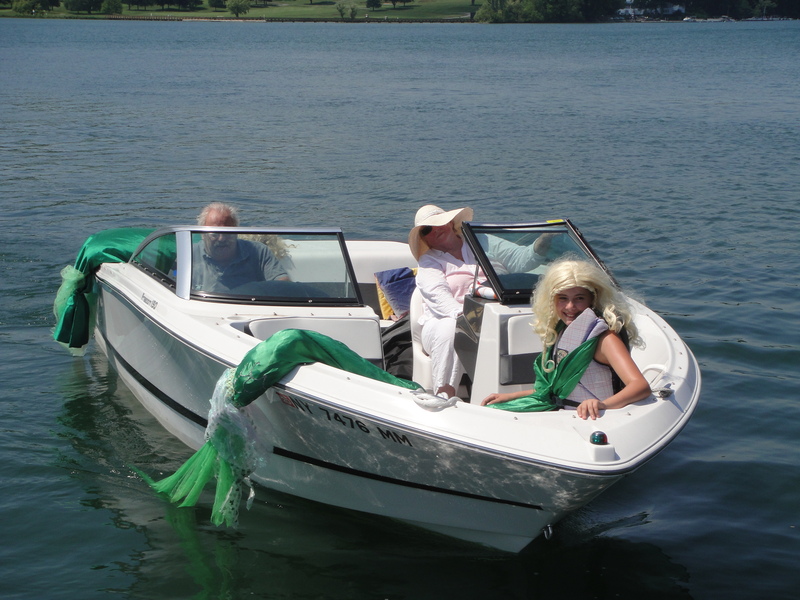 All individuals born on or after 5/1/96 are now required to successfully complete an approved course in boater education to operate a motorboat. Approved courses include those offered by NYS Parks, the U.S. Coast Guard Auxiliary or the U.S. Power Squadron. Individuals less than 10 years of age may not take this course of instruction. Certain allowances to this law have been made for visitors to New York, persons renting a boat from a livery and persons purchasing a new boat for the first time. Courses are being offered at Glimmerglass State Park on Otsego Lake. 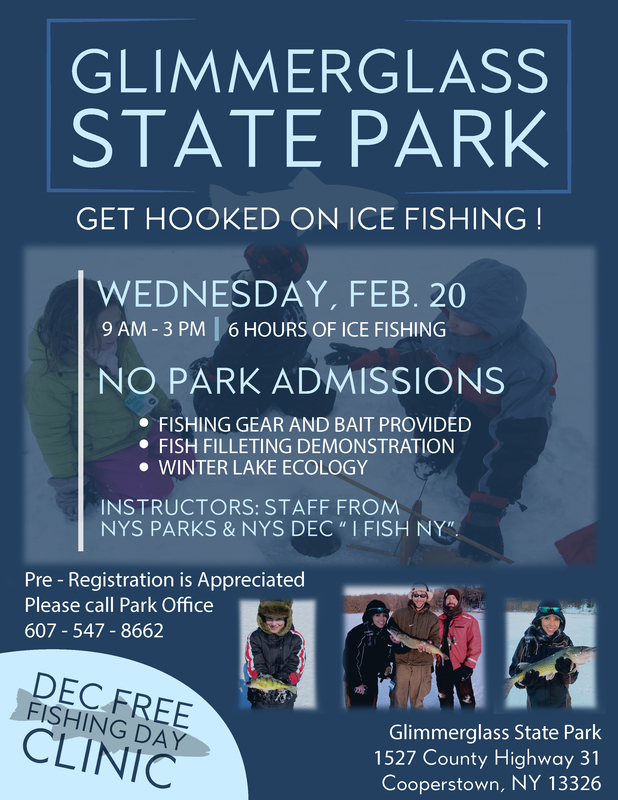 Call Bill Hanrahan 518-332-8259 to register or find a course near you on nyparks.com. Divers recover boat for church camp. 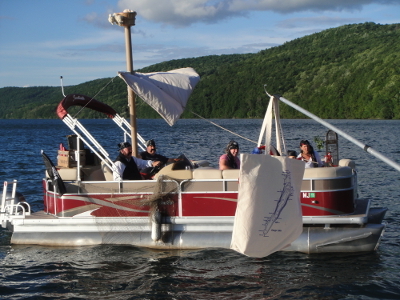 It was the summer of 1995 when a 16-foot fiberglass sailboat dubbed Blue Jeans filled with water while being towed to shore, falling to the chilly depths of Otsego Lake near Cooperstown. The boat belonged to the Pathfinder summer camp operated by the American Baptist Church. When divers made several attempts to locate it, they could find no trace of it. But an image that appeared to be the lost vessel showed up in a side scan sonar survey funded two years ago, by a professional underwater archaeologist from the Saratoga Springs area, Joseph Zarzynski. He was working in conjunction with the dive team of the Biological Field Station that is an arm of the State University College at Oneonta. - Read the entire story here. - Check out the pictures here. 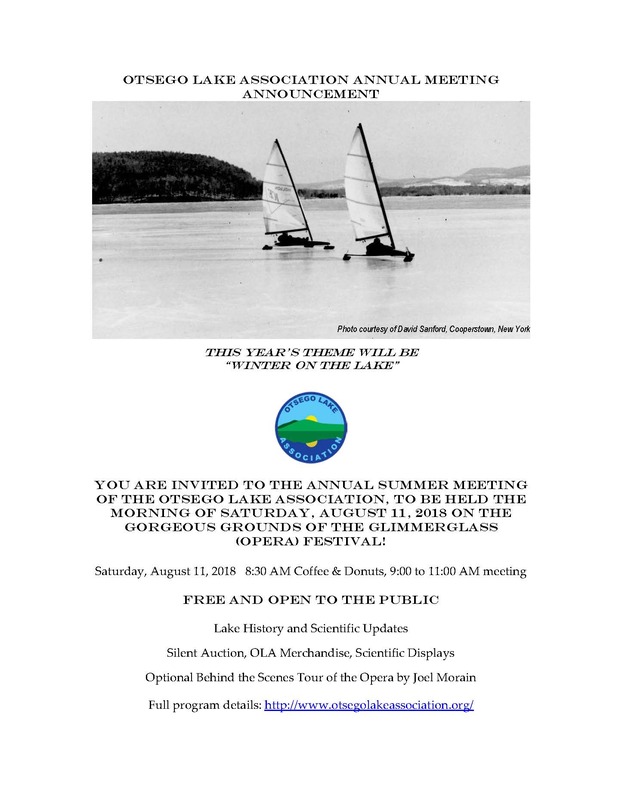 Press Release - Otsego Lake Assn. Features Otsego Lake Nostalgia at Historic Camp Minnetoska. 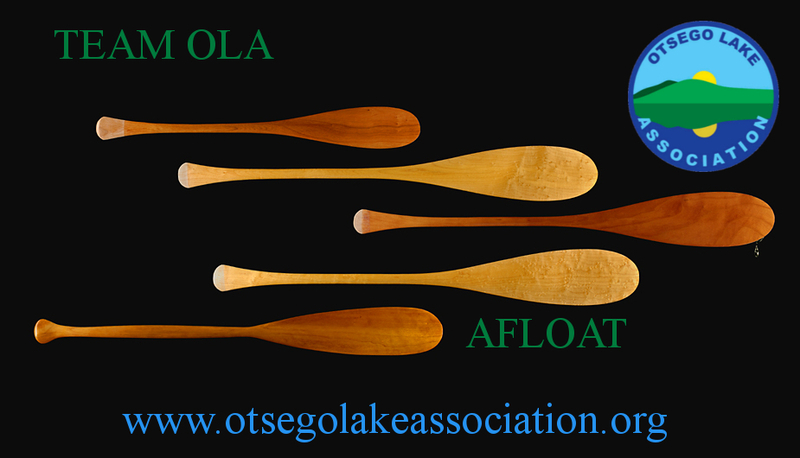 Dateline: Cooperstown, NY -- The Otsego Lake Association (OLA) will hold its 2014 annual meeting at historic Camp Minnetoska, a former Girl Scout camp now privately owned by the Clark Foundation, located at 759 County Highway 31 north of the Village of Cooperstown. 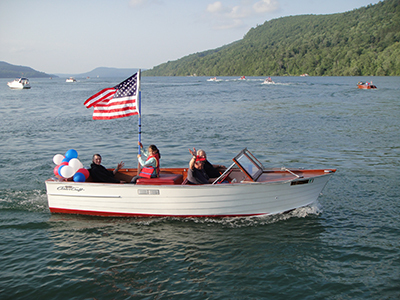 A full program of topics related to boating on Otsego Lake will be offered free of charge to Association members and non-members on Saturday, August 9, from 8:30 to 11:30 a.m. The Saturday morning events kick off with coffee and doughnuts, prior to the brief business meeting, which will include the election of officers and the presentation of the Lake Citizen Award. The first Annual July 4th Otsego Lake boat parade was a huge success many thanks to the boat parade committee for all their hard work in organizing the event. 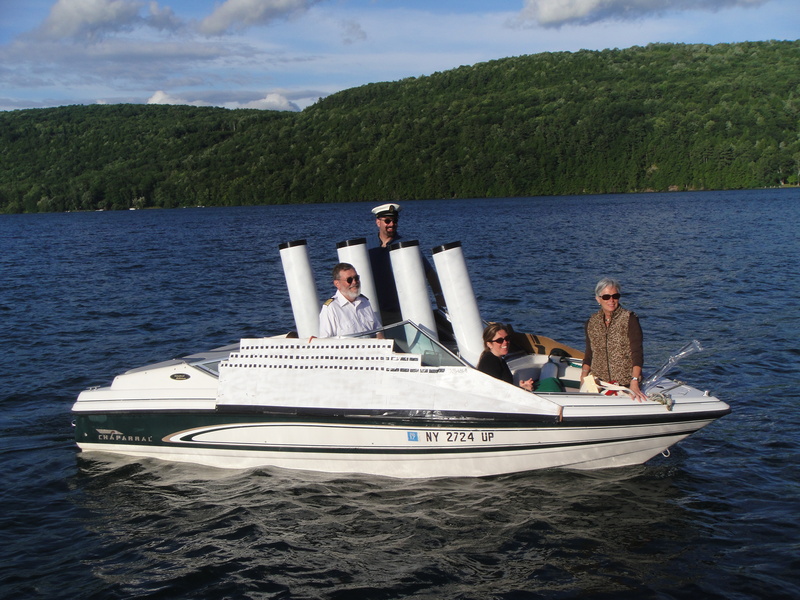 Special thanks to Louis Busch Hager Jr. and his boat the Chief Uncas. 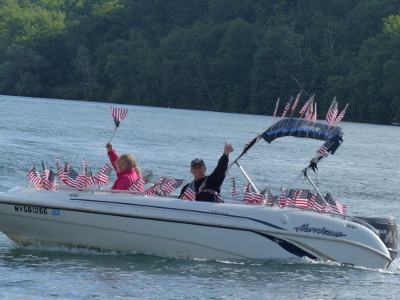 Very special thanks to the 35 plus decorated boats that participated. Some pictures of the parade have been uploaded click here. 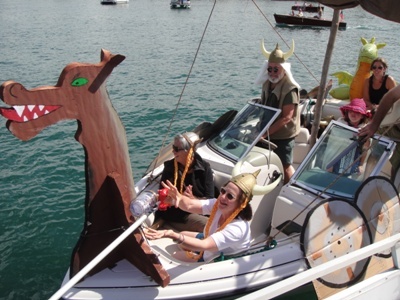 With so many amazingly decorated boats it was very difficult for the judges (Scottie Baker, Wayne Bunn & Paul Lord) to choose the winners. Congratulations to the following winners. 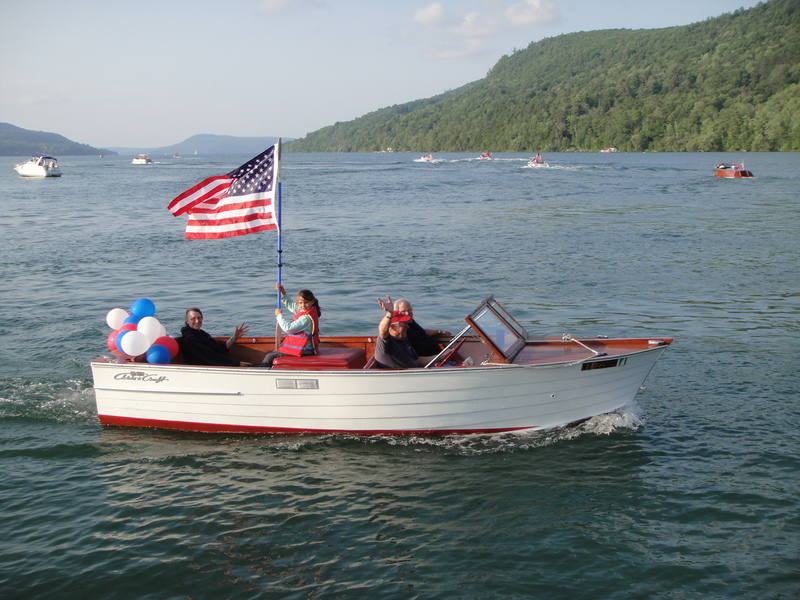 Antique or classic Boat: Chief Uncas - Louis Busch Hager Jr.
Patriotic theme: Flags - Catherine and Don Raddatz. Photo credit for Patriotic theme: Tina Claiborne (daughter of Scottie Baker). Attention photographers!! 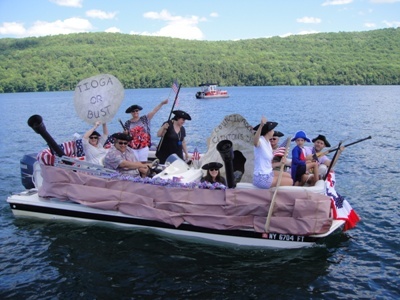 Weather you float your boat or view from shore submit YOUR best photo of OUR "We Love Our Lake, Boat Parade" held on July 4th, 2014 on Otsego Lake, NY to info@otsegolakeassociation.org. If your photo is used on our website or other OLA promotions, you get one FREE OLA t-shirt. Limit one entry/photo per person. Entries must be submitted via email by 5:00pm Tuesday July 15th, 2014 to be eligible. Submitted photos must be used by December 31st, 2014 to receive prize. After December 31st, 2014 OLA reserves the right to use all photos on our website and/or promotions without awarding a prize. Please provide name & additional contact information so we may contact any winners and provide photo credit to each entry. If more than one photo is submitted only the first photo will be considered for prize. OLA is not responsible for lost or misplaced entries. 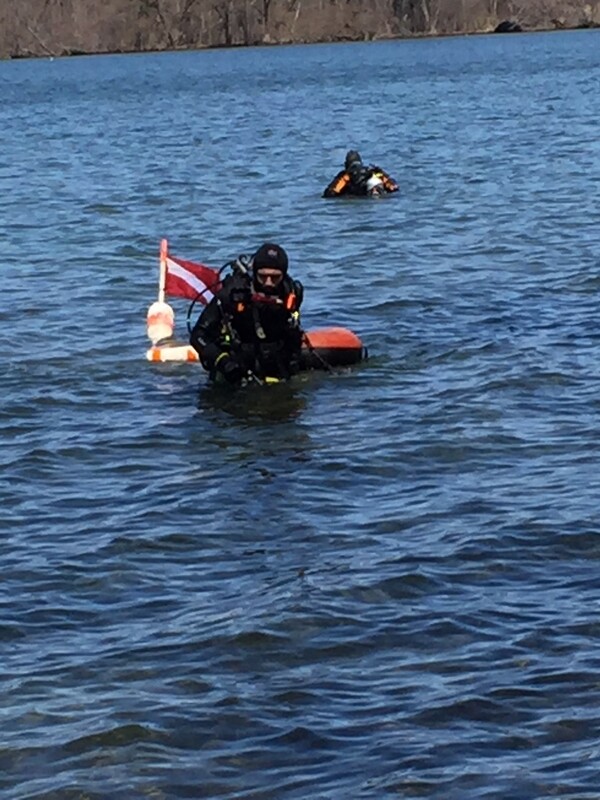 The all-volunteer dive team has deployed all 19 no-wake buoys for the 2014 season. The all-volunteer dive team needs your help. Certified volunteer divers & dive tenders/boat drivers are needed to assist with BFS projects throughout the summer. If you can volunteer your time please contact Paul.Lord@oneonta.edu for more information. Things are really coming together for 2014. 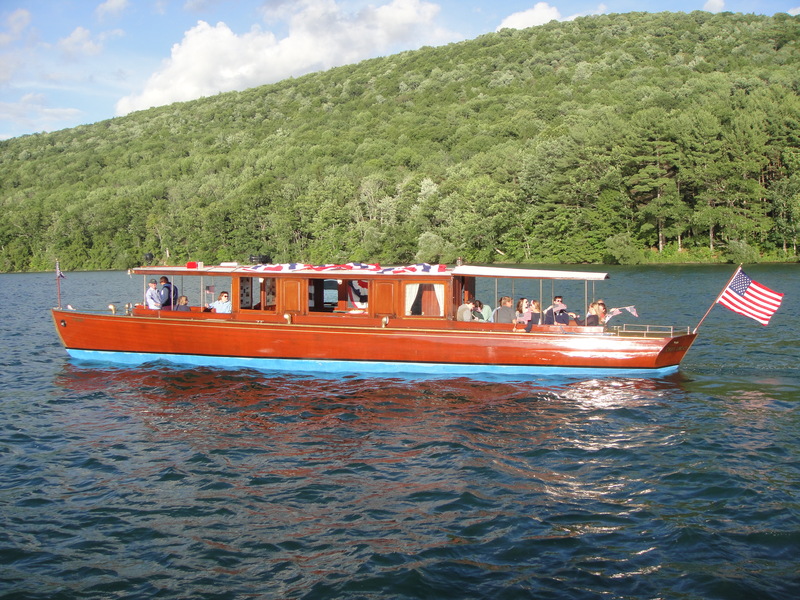 The annual meeting is Saturday August 9th, 2014 at Camp Minnetoska on historic boats. 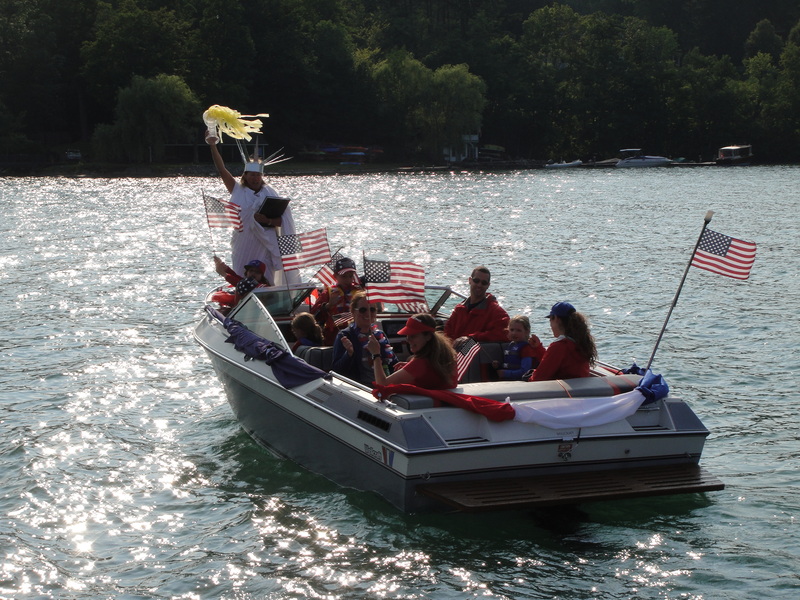 A boat parade with prizes will be on July 4th. Be on the lookout for new publications and new projects that help protect the lake. Click events to find out more about the boat parade and annual meeting. Read the minutes here. 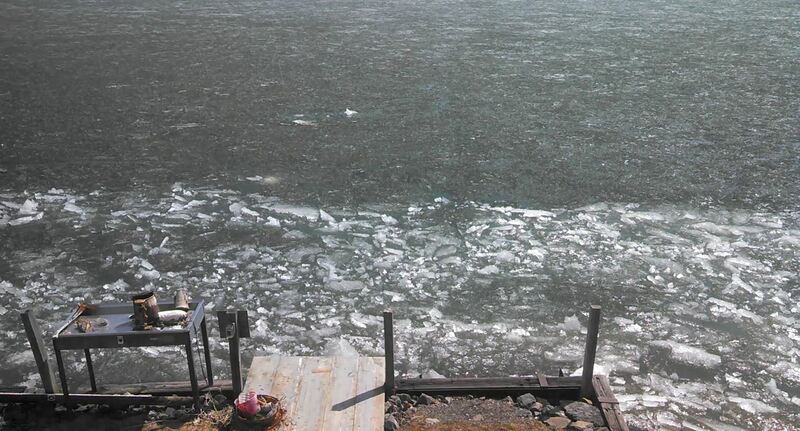 Otsego ice out is here, spring is just around the corner. OCCA announces Otsego Lakes Festival. 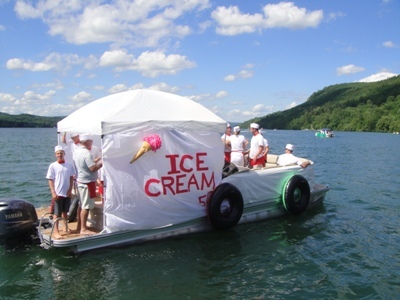 The seventh Otsego Lakes Festival will be held this year on Saturday, July 12 at Lakefront Park in Cooperstown from noon to 5 p.m. 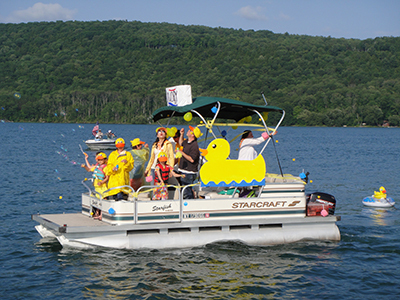 Organized under the aegis of the Otsego County Water Quality Coordinating Committee, the Lakes Festival offers residents and visitors alike a day full of fun and festivities celebrating our lakes - educational exhibits, children's activities, hands-on workshops and lake tours will all focus on the importance of protecting our waterways and ensuring water quality throughout our region. OCCA Executive Director Darla M. Youngs serves as WQCC facilitator and on the Lakes Festival Planning Committee. 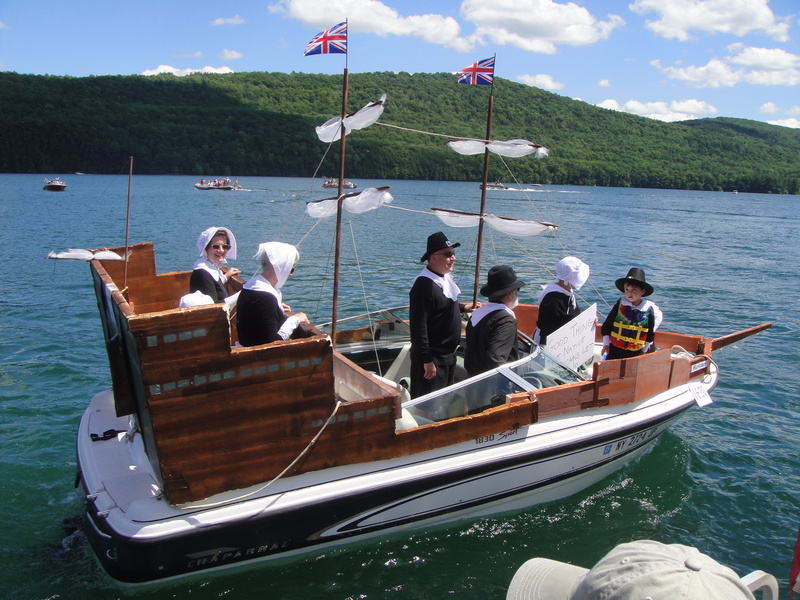 To make a financial contribution toward the Lakes Festival, or to register as an exhibitor or vendor, please contact Youngs at admin@occainfo.org or (607) 547-4488. Beautiful day on the ice today looking northward. Board of Directors meeting. The agenda was packed full of excitement for 2014. Read the minutes here. We welcomed three new members to the board. Michael Richtsmeier, Director for the Town of Middlefield. Bob Sutherland, Director for the Town of Springfield. 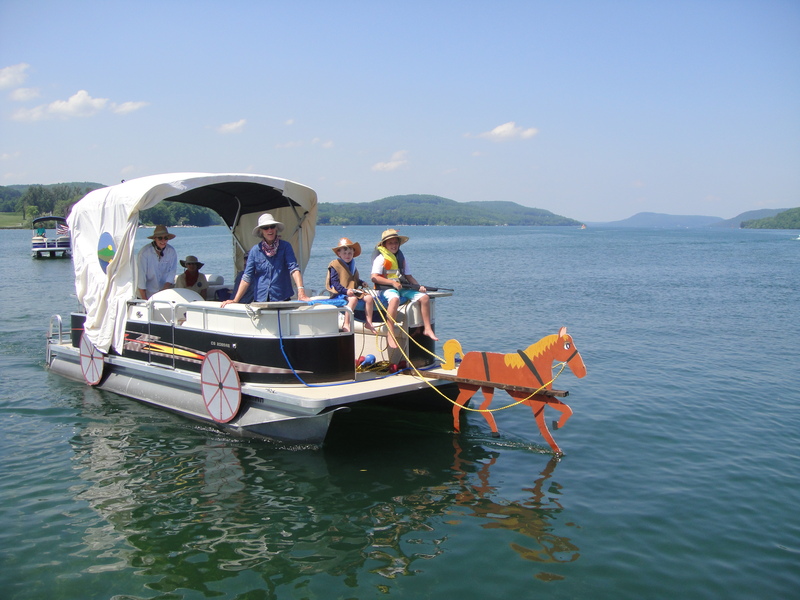 Find out what's been happening in and around Otsego Lake these past few months in "Our Glimmerglass” A Newsletter from the Otsego Lake Association - Autumn 2013. We wish you a safe and happy Holiday Season! 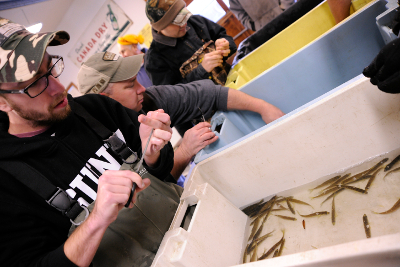 Otsego Lake receives 10,000 fall fingerling walleyes. 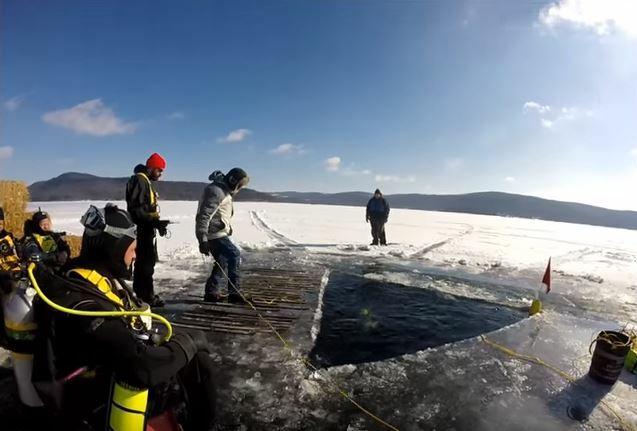 Volunteers from SUNY Oneonta, SUNY Cobleskill, NYSDEC and the public helped mark (fin clip) the walleyes before releasing them into the lake. Board of Directors had their most recent meeting. Read the minutes here. We had some big changes in the Board of Directors. 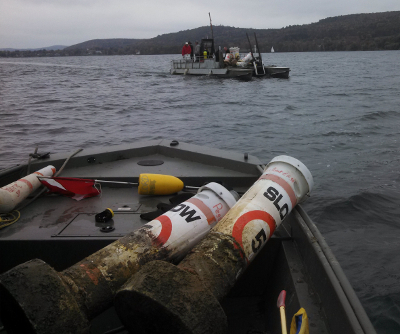 All no-wake buoys have successfully been removed from the lake. Buoys have been stored for the winter awaiting spring. 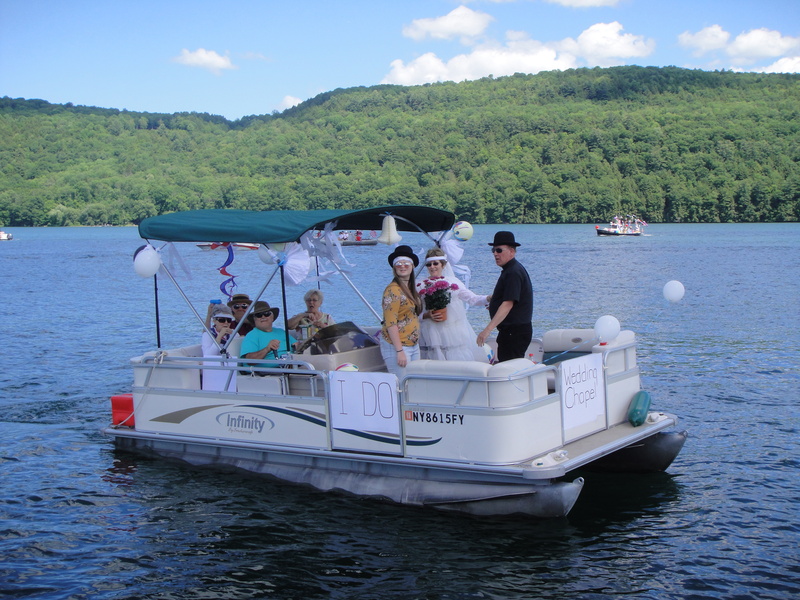 Saturday, August 17, 2013 was the annual meeting of the Otsego Lake Association. If you were unable to attend, here is a report. The meeting was held at the historic Camp Minnetoska, formerly the old Girl Scout Camp, at 759 Hwy 31 in Cooperstown. Thanks to the Clark Foundation for providing the meeting venue. Approximately 100 people attended to hear and see “A Morning of Lake Reminiscences and Nostalgia.” This was one of the largest crowds to ever attend an OLA annual meeting. The meeting started at 8:30 am with complimentary coffee and breakfast treats, followed by a formal OLA meeting and programs. Local newspaper articles about the meeting. Wayne Bunn receives a framed certificate thanking him for the longest served presidency of the OLA (2008-2013). The certificate also recognized Wayne’s development of programs with relevancy to lake residents. Wayne was then presented with a special OLA T-shirt by Scottie and a framed vintage lake postcard by Mickie. The membership expressed their appreciation for Wayne’s service with a warm round of applause! 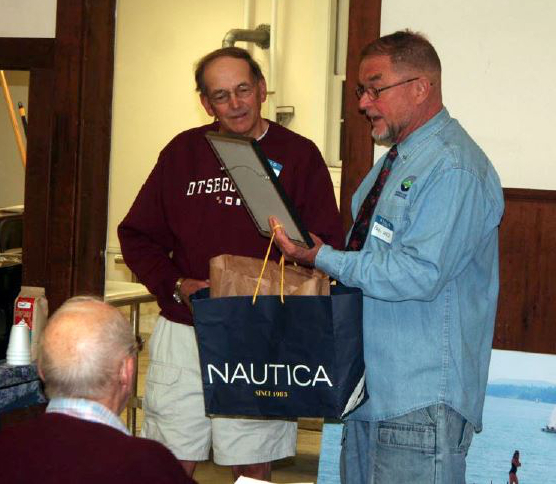 Paul H. Lord (right), an OLA board member at the 2013 annual OLA membership meeting, presents outgoing OLA President Wayne Bunn (left) with gifts of appreciation. Wayne served as president from 2008-2013 (Photo courtesy of Paul Donnelly). 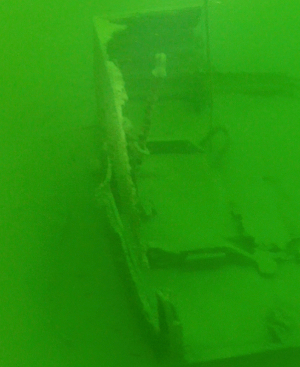 The dive team found a wreck 73 Years after it sank. Watch the video here. 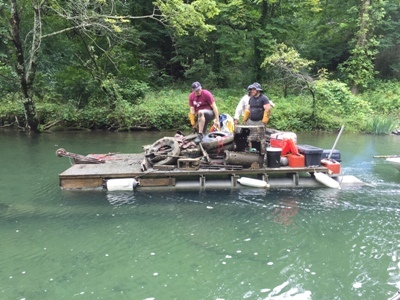 Eric Coe (recent SUNY Oneonta graduate) received funding for materials from OLA to construct 2 nuisance invasive species disposal stations for Cooperstown & Springfield boat launch sites. 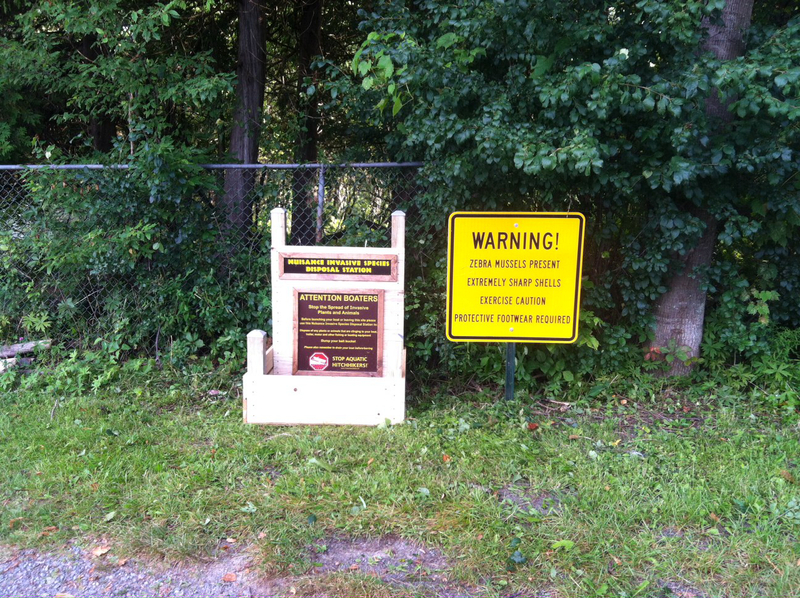 These stations serve as a location for anglers and boaters to dispose of invasive species that may be attached to their fishing and boating equipment. The stations also serve as a reminder to inspect your equipment before leaving a launch area. 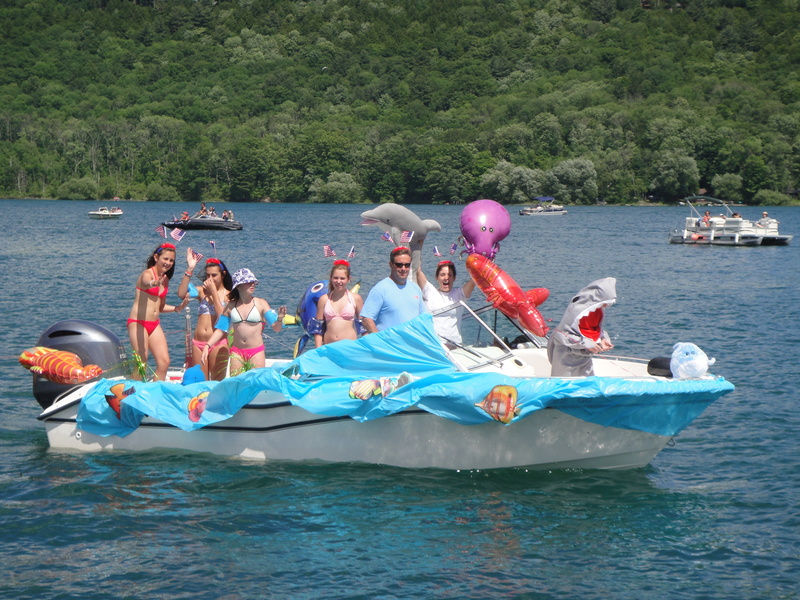 A special thanks to all the participants, judges and the Otsego Lake Association for sponsoring the prizes. View all the photo submission on the OLT website. Later this year, on September 25, is the 20th anniversary of the release in the USA of director Michael Mann’s “The Last of the Mohicans” movie that starred London-born actor Daniel Day-Lewis. The 20th Century Fox motion picture was a film adaptation about Cooperstown’s James Fenimore Cooper’s 1826 novel about the 1757 fall of Fort William Henry (Lake George, NY) during the French & Indian War (1755-1763). 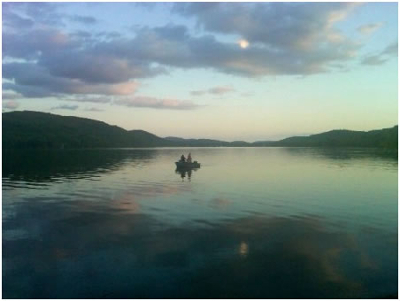 Ironically, Mann’s movie was not filmed on location around Lake George or at Otsego Lake. It was shot in North Carolina. Per Kate Gray, (A History of Springfield) the road down the east side of Otsego Lake was built by public subscription in 1795. 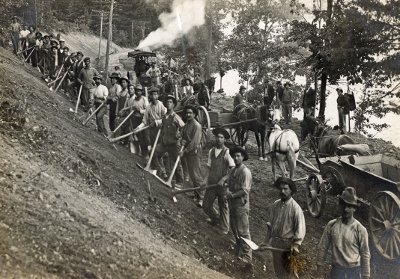 Burr Southworth remembers when it consisted of two dirt tracks with a strip of grass in between. There was a narrow steel bridge by Pathfinder. There was no winter maintenance. When the road was paved after the war (World War 2, that is) that bridge was replaced. It was re-placed again not many years ago, the county drove pilings to shore up another bridge. Outside of that the road lasted until Irene and Lee happened by. Following the success of the Buffer Strip at the Lake Front Park, some other organizations have asked for our help to construct buffer strips, namely at Public Landing (Town of Springfield) and The Fenimore Art Gallery (The New York State Historical Association). 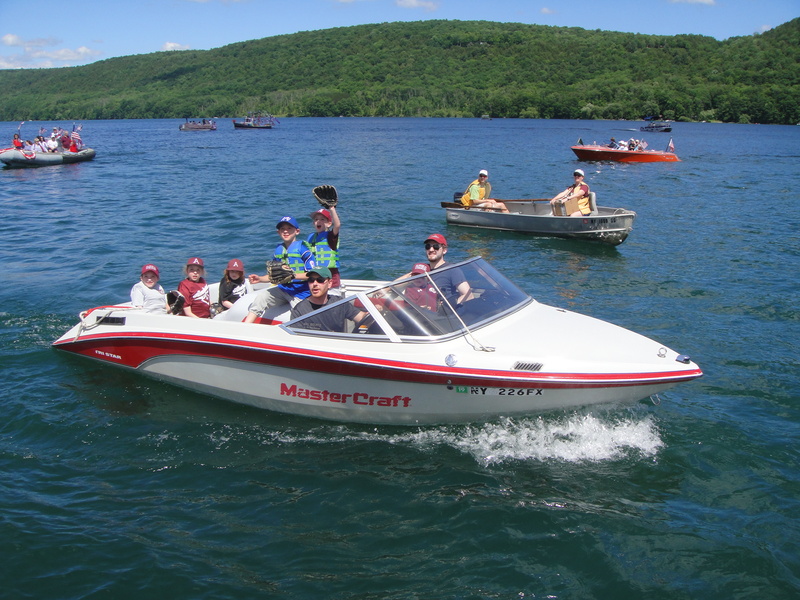 A new law in New York State now requires all boaters on recreational watercraft less than 21 feet in length (including motorboats, canoes, kayaks, rowboats, and sailboats) to wear a securely fastened, U.S. Coast Guard-approved personal flotation device (PFD) of the proper size from November 1st to May 1st while on New York State waters. 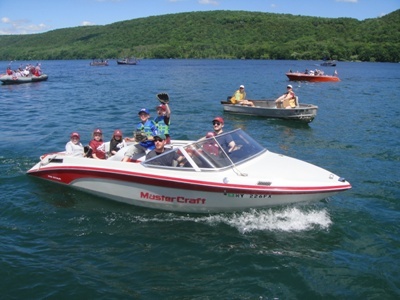 New York State law already required PFDs for all children younger than 12 years old on boats less than 65 feet - with life jackets on board for all others. 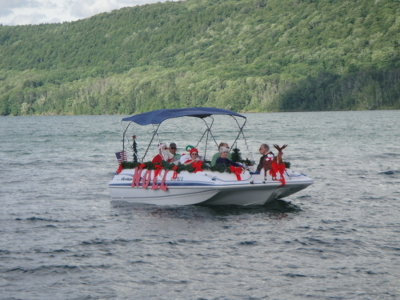 They must also be worn by anyone in tow, including water skiers and tubers, and by all riders on personal watercraft. It is reported by New York State that immersion in water colder than 40 degrees Fahrenheit can lead to hypothermia and passing out within 15 minutes. The Biological Field Station Dive Team was awarded the Otsego Lake Association's Lake Citizen Award in 2009 which is given each year to an individual or organization that works to protect and preserve Otsego Lake. Congratulations. 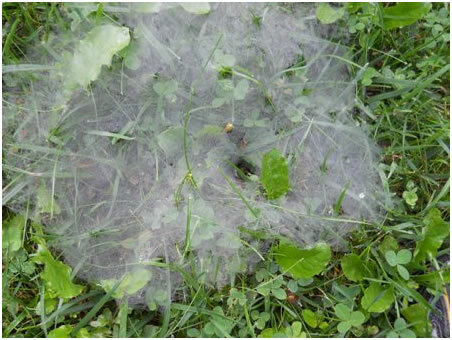 When you purchase lawn fertilizer and/or dishwasher detergent for your camp or lakeside home, please think about Otsego Lake and buy phosphorus free fertilizer and dishwasher detergent sold in local garden supply stores, super markets, and health stores. Phosphorus (chemical symbol “P”) is a huge food source or nutrient for the algae and weeds in the lake and OLA encourages everyone to do their part to reduce the amount of phosphorus that ultimately may end up in the lake. If your yearly cycle resembles mine, things slow down, ever so slightly, at this time of the year (except when we are shoveling snow). 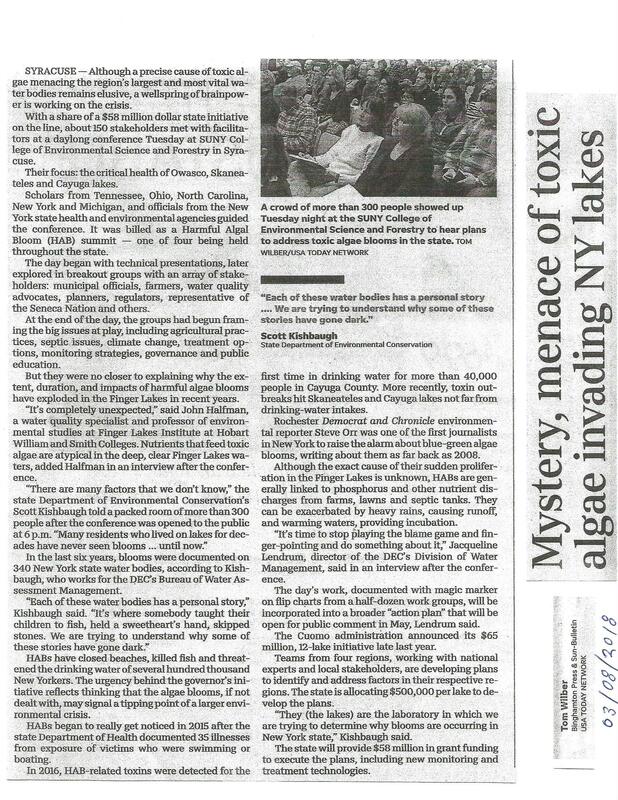 This letter is intended to focus our attention on Otsego Lake and its protection at a time when many of us are not focused on the Lake. Unfortunately, adverse human impacts continue unabated in this time of the year when few of us are actually enjoying Otsego Lake. 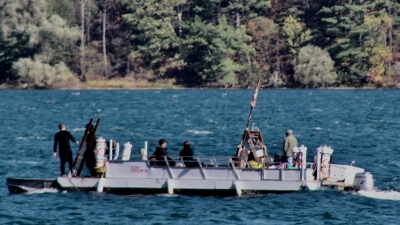 The Biological Field Station (BFS) on Otsego Lake has been monitoring chloride levels in the Lake for decades. These levels are up 30-fold in less than 100 years and continue to rise. It appears the reason is pavement salting. Please compare and note the similarities in the following two graphs. OLA is hard at work with two major partners, the Lake & Valley Garden Club, and the Otsego Northern Catskills Board of Cooperative Educational Services (BOCES), on rebuilding the land-water interface in Cooperstown’s Lake Front Park. Intended to be a pleasant framing for the Lake view offered by the park, the 30 feet closest to the Lake is being replanted with deep rooted plants more appropriate to lakeshore areas frequently flooded by temporarily high water. BOCES scholars grew annual plants, rooted willows hydroponically, and built a boardwalk from OLA provided recycled plastic lumber. The Garden Club purchased and will transplant most of the plants to be used in this Lake buffer strip. This project starts on May 29th and continues through the summer although most of the work will be completed by June 3rd. Zebra Mussels have found their way into Otsego Lake. The dive team recently discovered a few adult zebra mussels in the lake. It appears they've been here long enough to reproduce. 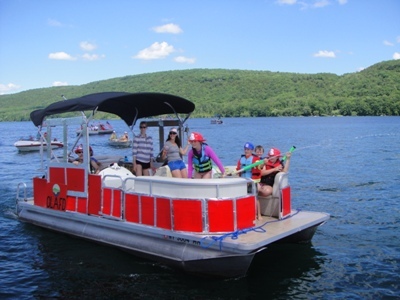 Although no one knows exactly how they ended up in Otsego Lake they most likely hitched a ride on a lake user's equipment from a nearby infested waterbody. After three years of paperwork, construction repairing the Clarke Pond dam and dredging its sediments was completed in January after four months of actual work. This is an important water quality improvement project, and is a major step toward implementing the Plan for the Management of the Otsego Lake Watershed (1998). Clarke Pond, an old mill pond dating back to the late 1700’s, is located near the end of Cripple Creek, just to the northeast of the Lake next to the Otsego Golf Club. 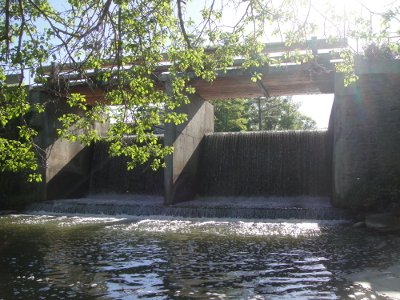 The pond, with a laid-up limestone dam built in 1847, has served as a detention basin collecting sediment from the 10,000-acre Cripple Creek drainage basin, which is part of the Otsego Lake watershed. In doing so, Clarke Pond has served to protect the lake. The pond was full of sediment and the old dam had deteriorated. 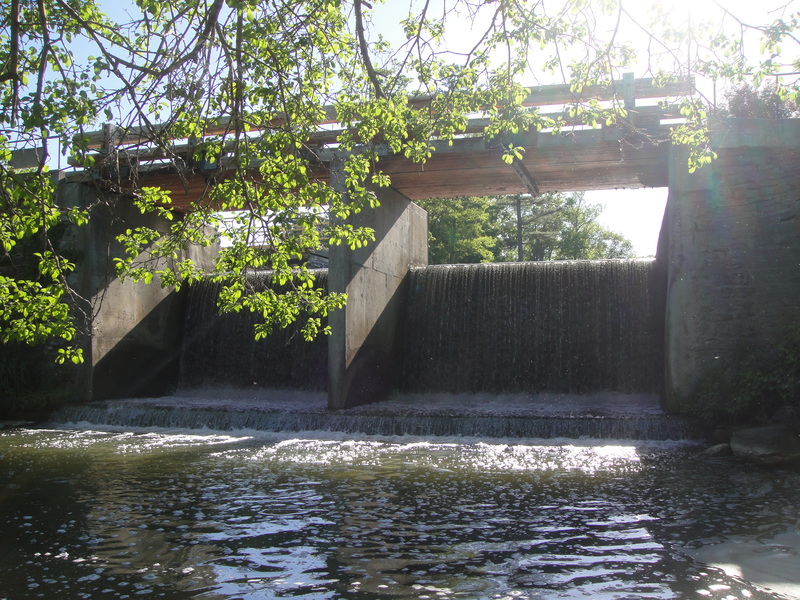 The dam has now been repaired and approximately 8 million pounds of sediment have been recovered. 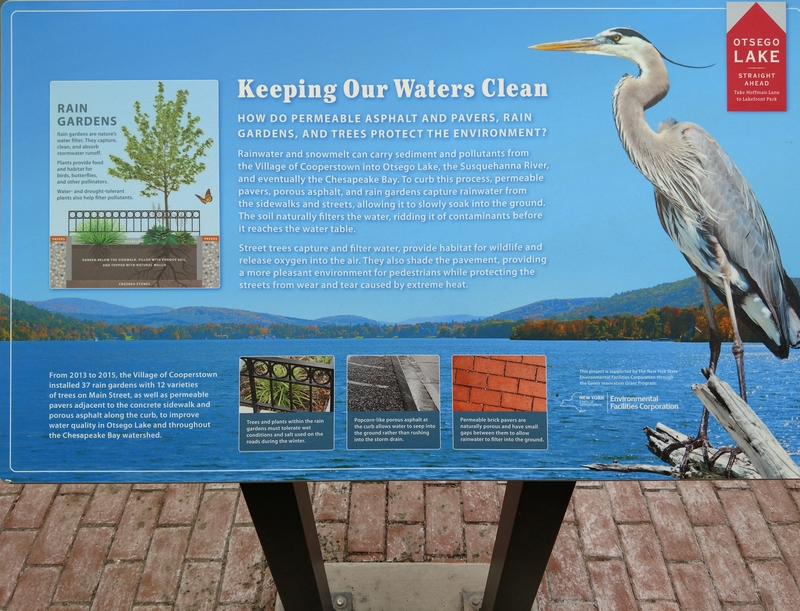 At year’s end, the Village of Cooperstown received a sizeable gift from the State of New York in the form of a $76,000 grant for its Otsego Lake septic system management program. Inspections of septic systems around Otsego Lake will begin in 2005. All systems within 500 feet of the lake and 100 feet of the lake’s tributary streams will be inspected and is in conformance with new regulations enacted in early 2004 under New York State Public Health Law. 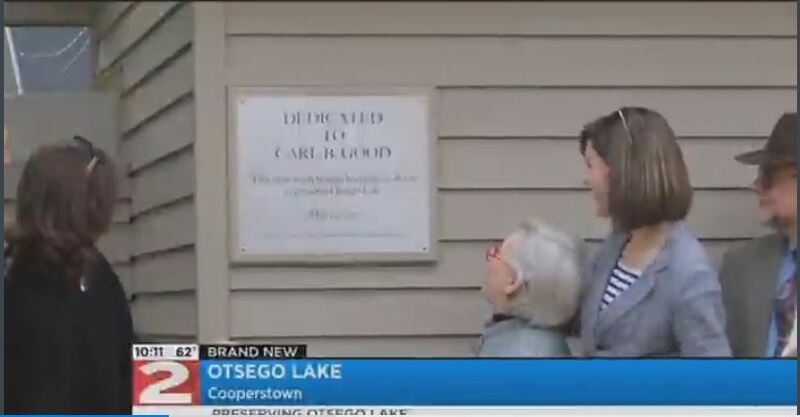 The new regulations are intended to protect Otsego Lake as a drinking water supply for the Village of Cooperstown and homes around the Lake. OLA President Dave Sanford congratulated Biological Field Station Volunteer Diver Jerry Munrett after presenting him an OLA T-shirt in recognition of his continuing contributions to the health of the Lake. The OLA President took time out from the October Board of Director’s meeting to present OLA T-shirts to six volunteer divers. There will be more in a future OLA News regarding these volunteers. The association received an advanced ruling from the IRS giving us 501 c 3 status. The associations exempt from paying federal taxes. Contributions and membership dues are tax deductible. Dr. Bill Harmen, Professor & Director of the Biological Field Station gives a talk about "Aquatic Nuisance Species: Much Bigger than Zebra Mussels".